After the long drive from Michigan to Albany, New York the previous day, the 2005 Decker Family Association reunion officially kicked off by meeting and touring the First Church of Albany. 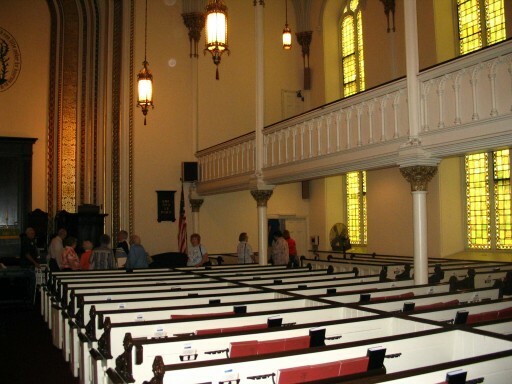 "Originally the Dutch Reformed Church, the congregation dates back to 1642, making it the oldest church in upstate New York. 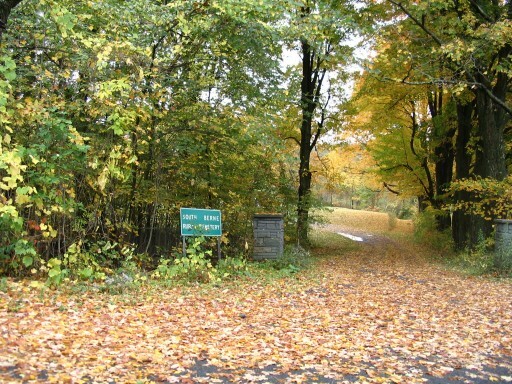 "At that time the town was called Rensselaerswyck, part of the Fort Orange complex. 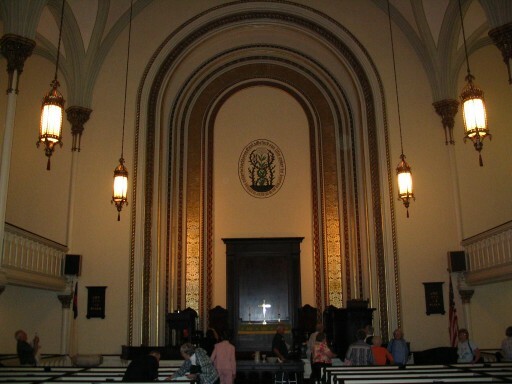 The building we'll tour is the fourth building for the congregation, and dates ack to 1798. 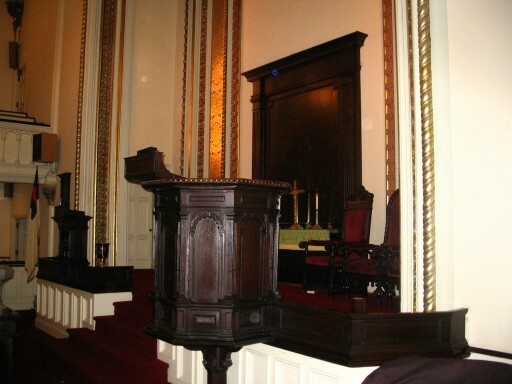 The pulpit, imported from Holland in 1656, is said to be the oldest pulpit in America. 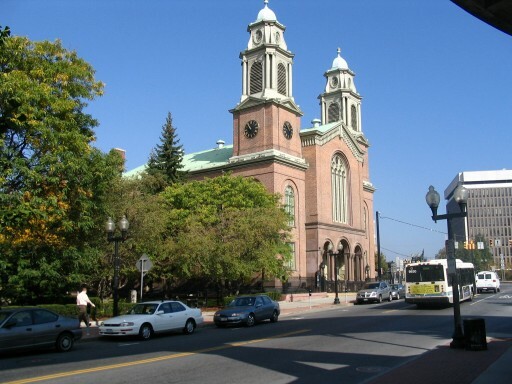 "The archives of the church provide invaluable genealogical information. 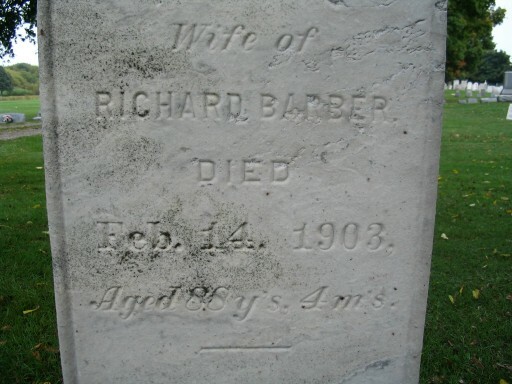 The college-educated ministers were meticulous in keeping records of births, deaths, marriages, and baptisms." 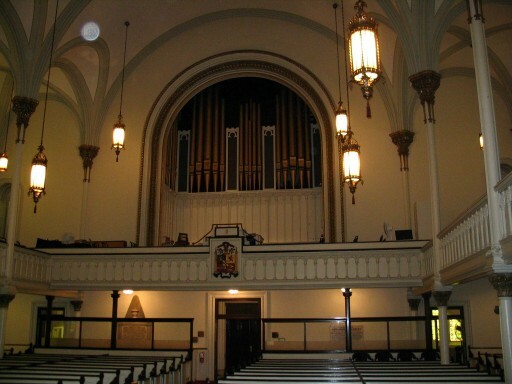 This is a very impressive, historic church. 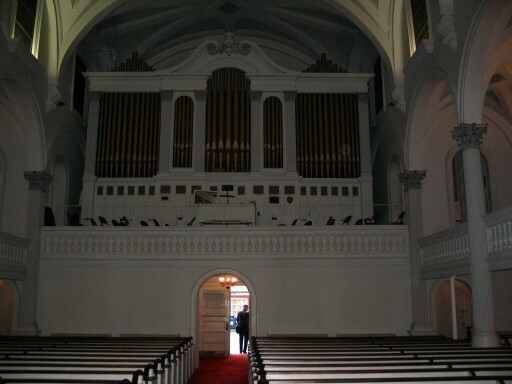 Organs & such were not the style of the early Dutch Reformed churches, but were added later. 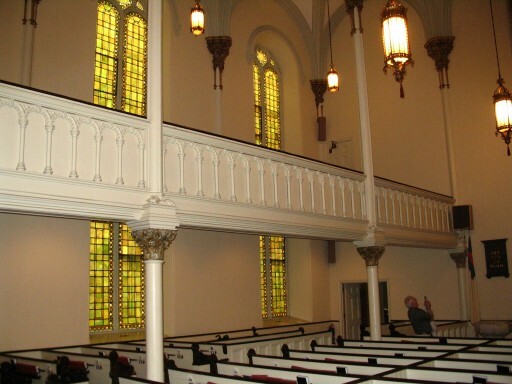 Also, the stained glass windows (and many other enhancements) were made during the early 1900s. 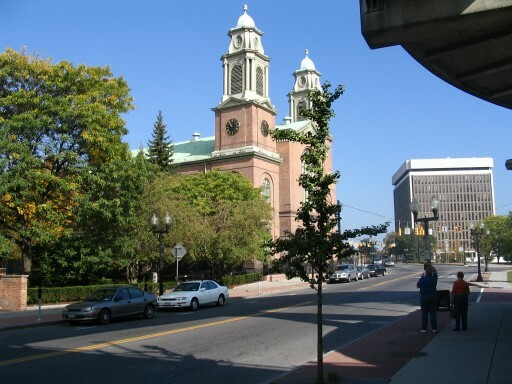 Following our tour and historical background of the church, we met outside and toured the area of Albany, New York, that was the site of the original settlement of Beverwyck. 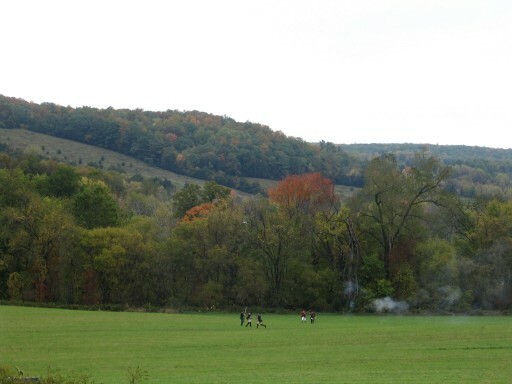 Led by Charles T. Gehring of the New Netherlands Project, the walk pointed out interesting historical points in the development of Albany, and ended near the riverfront of the Hudson River. 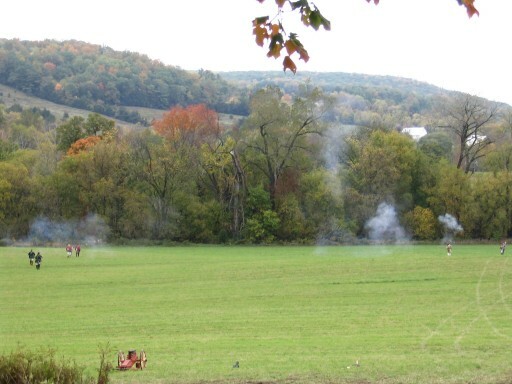 Just across the river from Albany is the historic site of (Fort) Crailo. 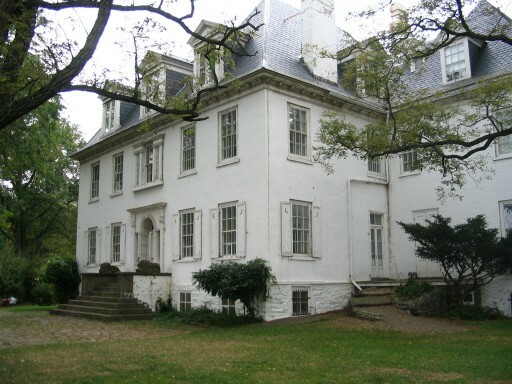 This historic site, currently the location of a museum, is most famous for being the site where "Yankee Doodle" was written, on the grounds of this estate. The outside of the house has a number of "keyhole" type ports handy for using guns to defend the building. 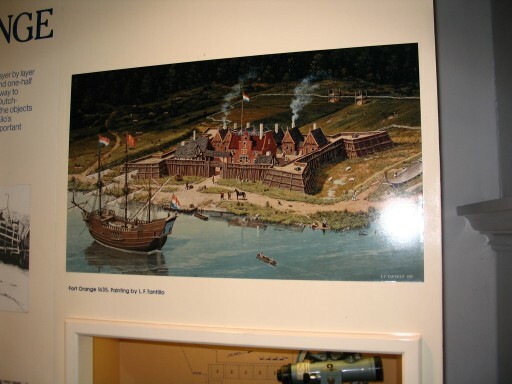 The picture of the Fort was taken inside the museum, depicting the way Fort Orange looked during the 1600s. 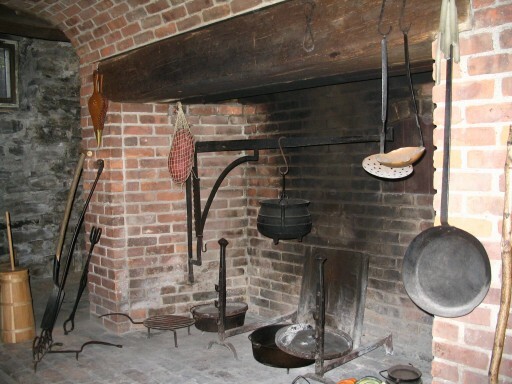 The kitchen, located in the basement of the house, was a very interesting look into the life within Crailo. 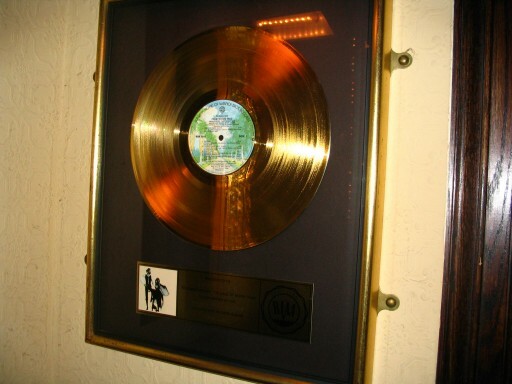 I really enjoyed our tour of the Half Moon. 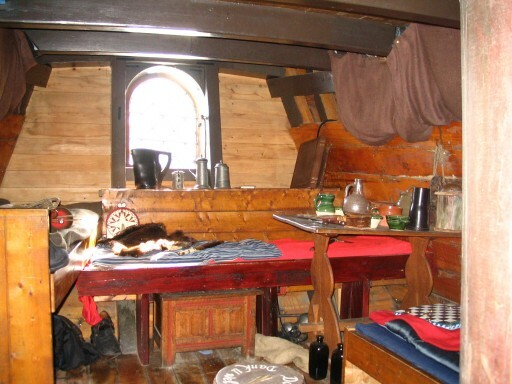 While it is earlier than the ships used to settle the area in the later 1600s, it does represent the type of ships used in the day, and very possibly the type of ship that Jan Broersen reportedly sailed on around 1644. 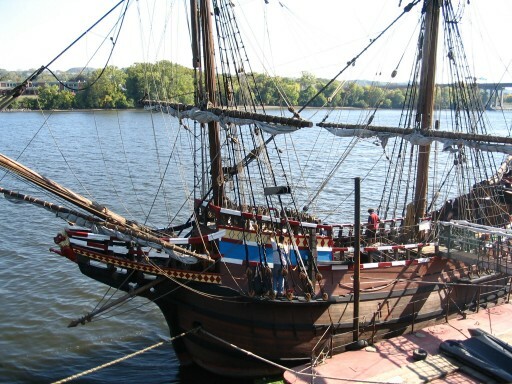 "The New Netherland Museum operates the Half Moon, a reproduction ship that Henry Hudson sailed from Holland to the New World in 1609. 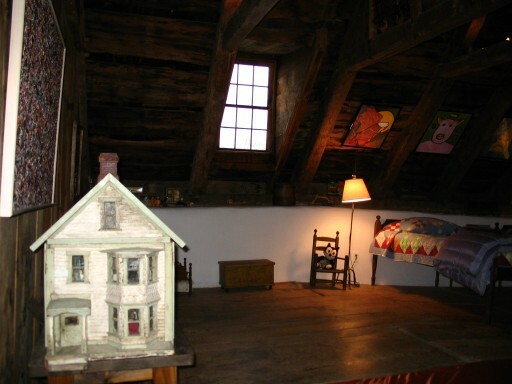 This plank-by-plank replica was created by the New Netherland Museum. 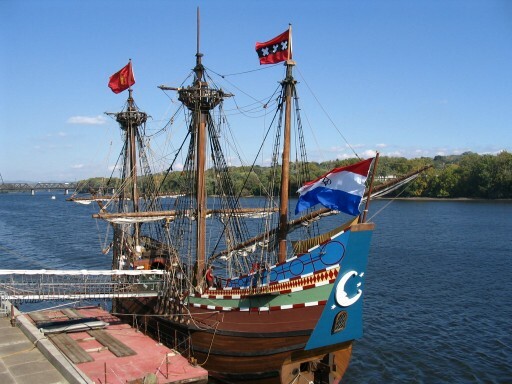 "The original Half Moon (Halve Maen) was commissioned on March 25, 1609, for the Dutch East India Company. She was a ship of exploration and the spaceship of her age, designed to take a crew of twenty into unknown and uncharted waters. 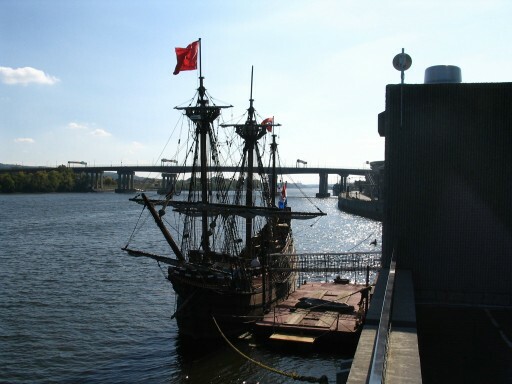 "Her captain, Henry Hudson, was already a famous explorer of Arctic waters when in 1608 he was hired by the Dutch East India Company to find a Northeast, all-water route to Asia. But only a month out of port, the Dutch/English crew of his ship was disheartened after their passage north of Norway was blocked by Arctic ice floes. Many talked of mutiny. 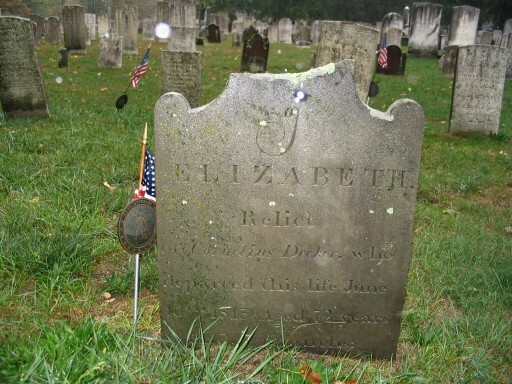 "After reaching the Maine coast and replacing a foremast lost in rough storms during her Atlantic crossing, the Half Moon sailed southward as far as the present day North Carolina Outer Banks. Then, turning northward, Hudson explored the Delaware Bay before arriving at the mouth of a wide river. Could this be a passage to the Pacific Ocean? 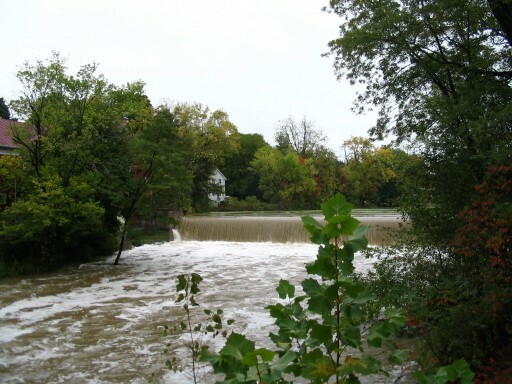 "Hudson stopped at points on the New Jersey coast before sailing the small ship up the river which today bears his name, but it was soon obvious that it was an inland river, not a westward passage. 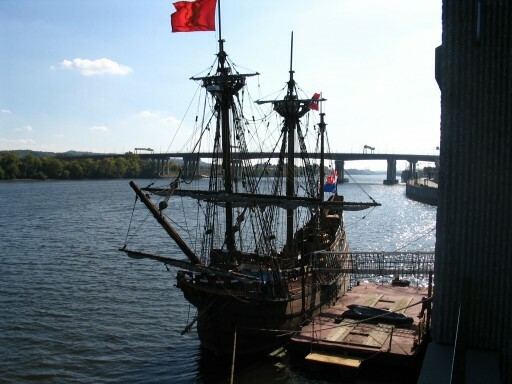 Hudson sailed upriver to present-day Albany before returning down river." 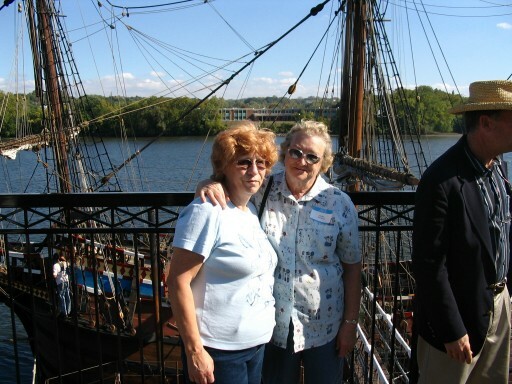 After our tour of the Half Moon, I took a picture of my aunt Jean (Decker) Hanke, an my mom Nora Decker. Later they had to put up with my driving all over the state of New York, but so far they were still smiling. 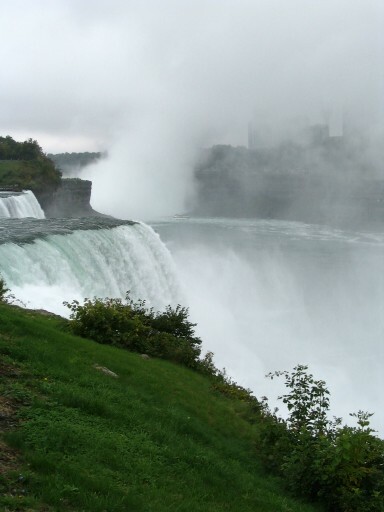 Finally, I also took a picture near this site, looking up the Hudson River, which was very scenic. 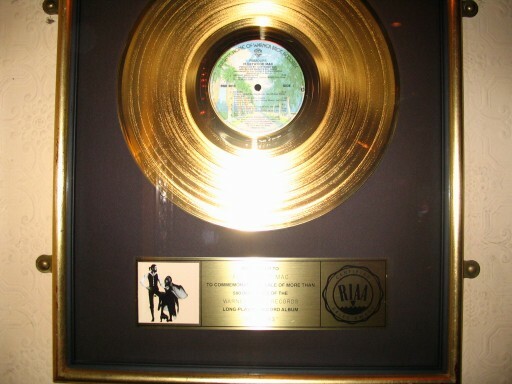 This picture is available in hi-resolution for use as a wallpaper. 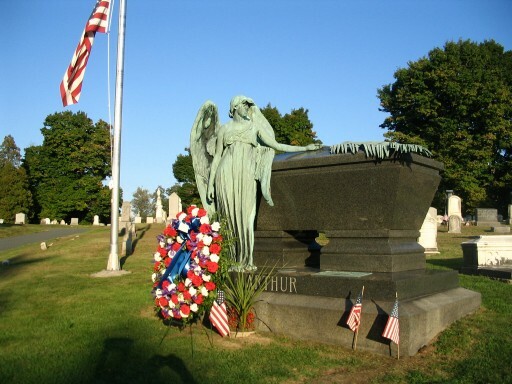 Although not part of the reunion itinerary, as a final part of our tour of Albany we decided to tour the Albany Rural Cemetery. 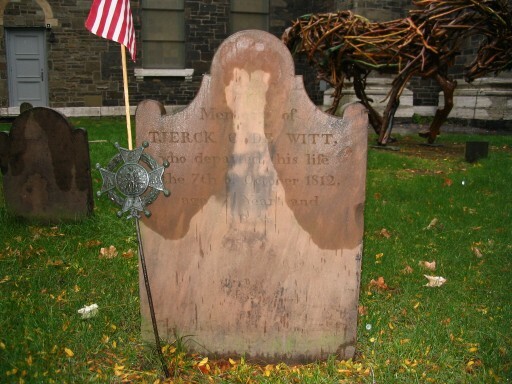 There was no real reason for wanting to tour this site, as I had never even looked at researching this cemetery really. What we found first of all, was a very interesting (& large) old cemetery. 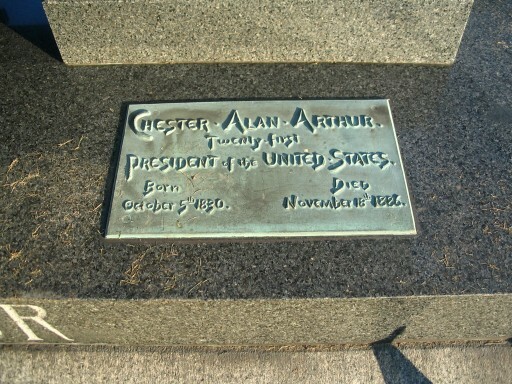 Of particular interest was the discovery that this is the burial site of President Chester Arthur. 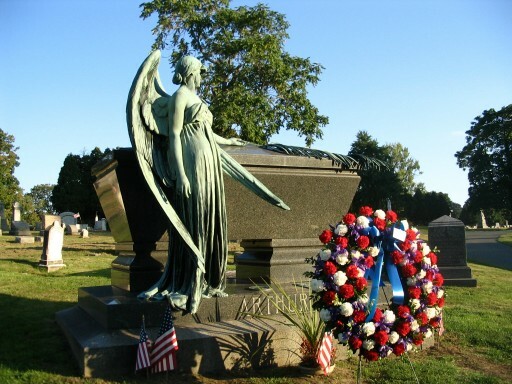 The wreath at his grave was fresh flowers, with a simple card that read "Mr. President." Our first stop of the day was actually across the river in Columbia County, at the home of the Livingston family called Clermont. 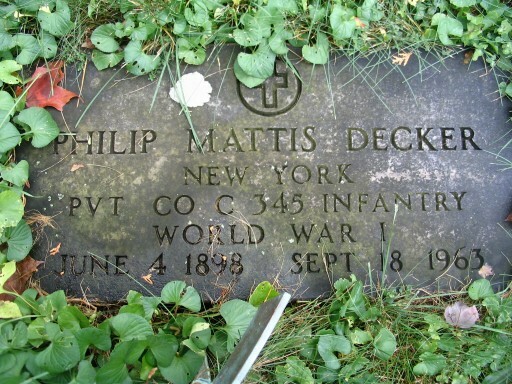 This site held particular interest to me, as my line of Deckers lived in this area for a couple of generations. 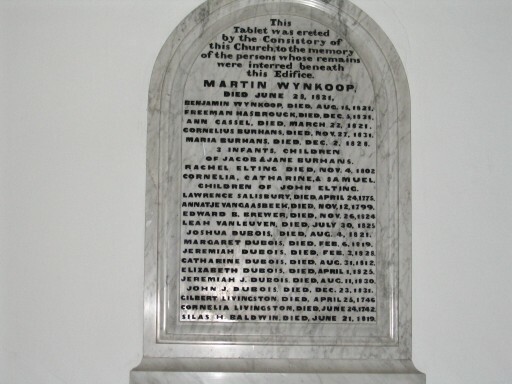 Gerrit Decker, great-grandson of Jan Broerson, was married in Columbia County, and his children were born there and baptized in the Linlithgo Reformed Church. 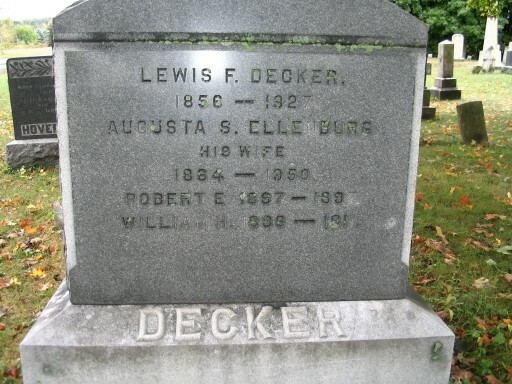 His son Myndert Decker is listed on the 1800 census in Columbia County, and his children were born here. I have a reproduction of the 1798 plat map of Livingston, Columbia County which lists many people with the name Decker living around the township (since divided into smaller townships). 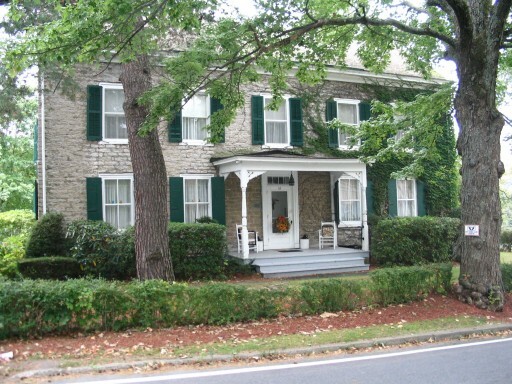 Clermont was a home to the Livingston family, one of several manors in the county, since the late 17th century. 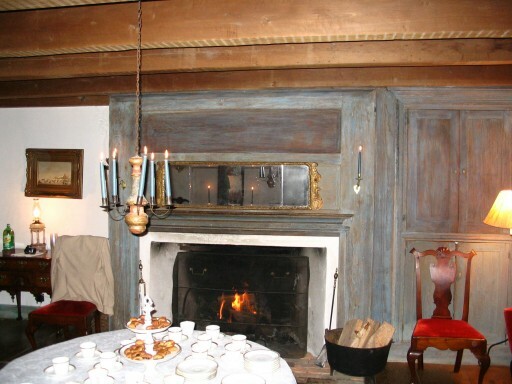 Staying in the family until the 1900s, the manor has all original furnishings that were owned by the Livingston family. 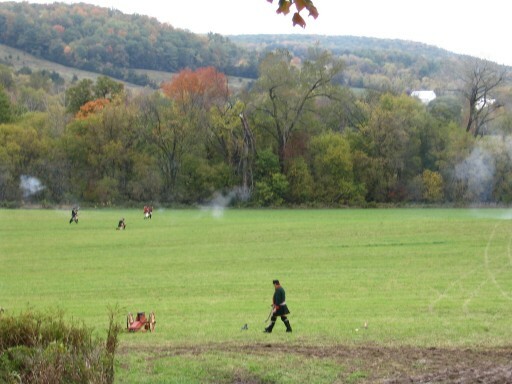 The family still occasionally holds reunions at the site, and Croquet on the lawn is a favorite past time, as it was many years ago. 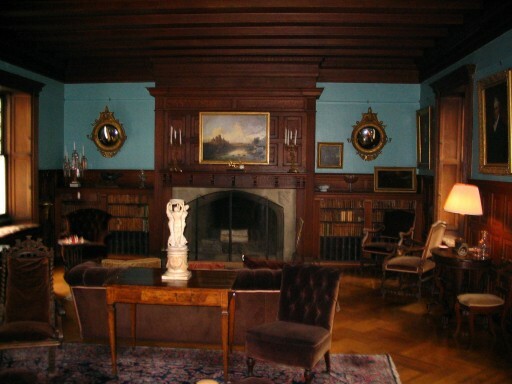 The bottom picture is that of the library, which was originally added onto the house as a billiard room (evidence of which can be seen in some areas). 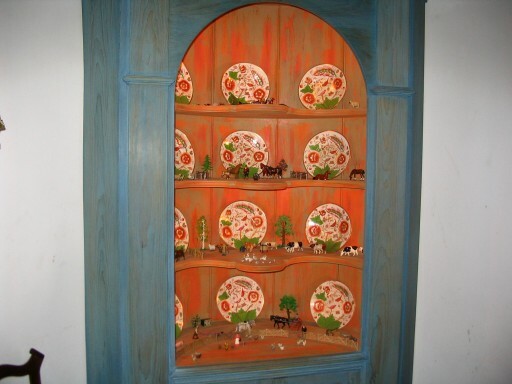 The woodwork and craftsmanship are excellent. 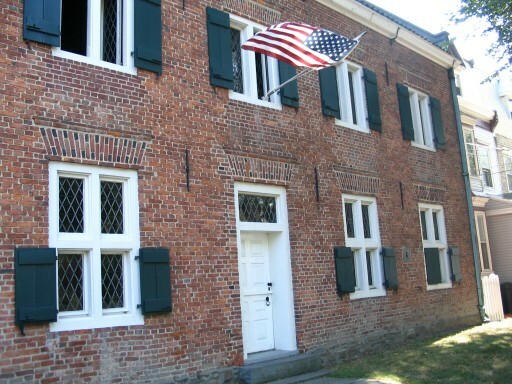 The home itself was burned by the British during the Revolutionary War, but was soon rebuilt, and later a third floor was added. 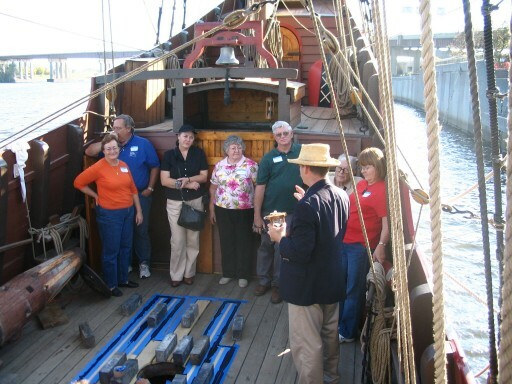 For more information see the Friends of Clermont site. 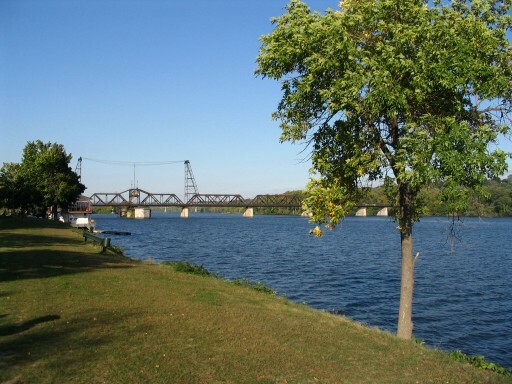 Second stop was Hurley, just outside of Kingston. 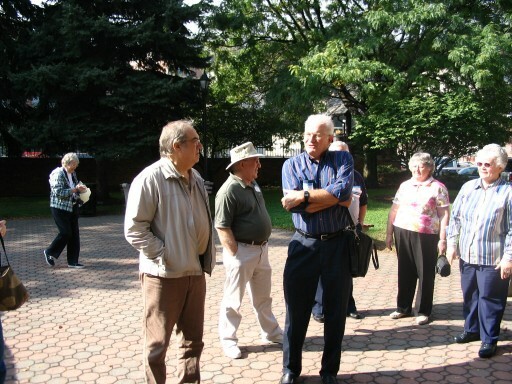 After lunch at the Hurley Mountain House we took a walk through old Hurley with historian Dave Baker. 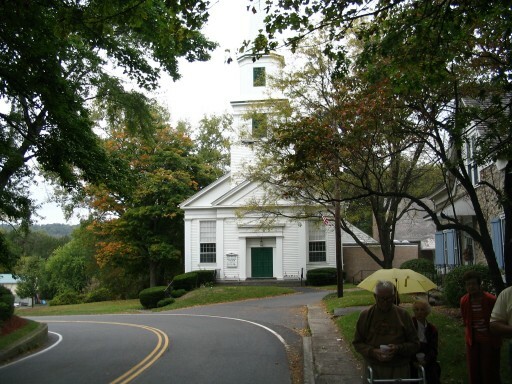 Jan Broersen, after living in Kingston during the stockade period, eventually ended up in this area, being named Magistrate of Horly (Hurley) and Marble (Marbletown) in 1673. 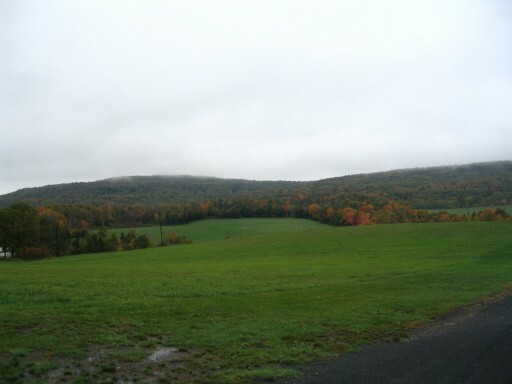 A light rain did little to hinder the enjoyment of the walk. 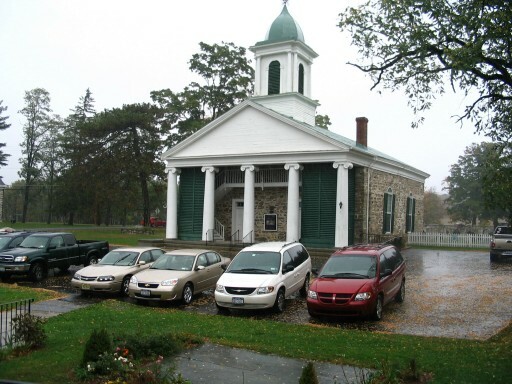 By the time we reached the Kingston Reformed Dutch Church, the rain had picked up a little bit. Thankfully all of our outdoor stuff, pretty much, had been completed. 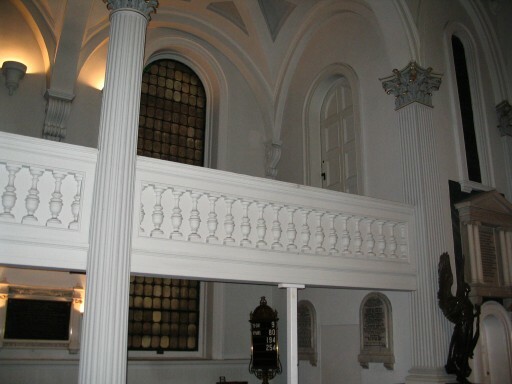 Although I had been to the church before (three years ago) during the winter, this was my first chance to go inside the church and learn about its architecture and history in more detail. 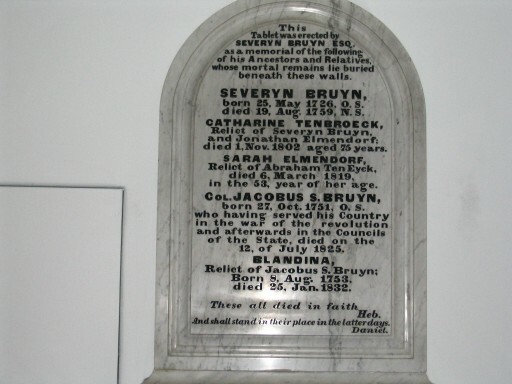 These plaques within the Kingston Reformed Dutch Church contain the names of the individuals who were buried in the churchyard on the site where the current church was built. 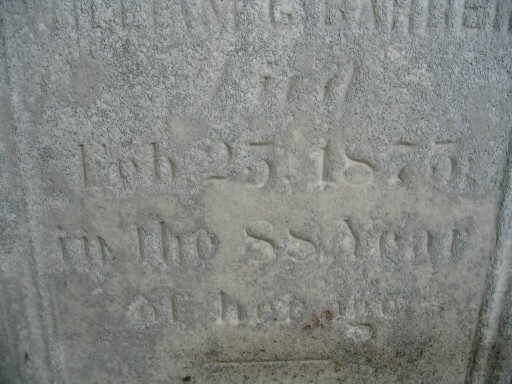 Their gravestones were moved to another location in the cemetery with an 'X' marked on the back identifying them as stones that have been moved. 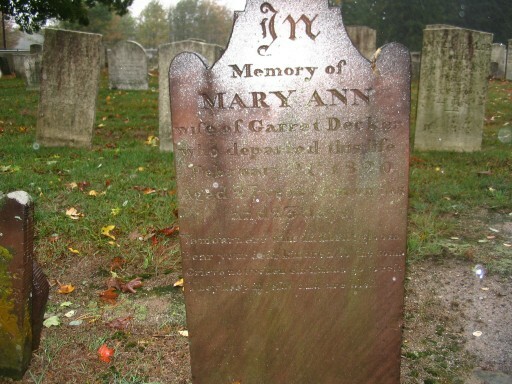 Although it was raining, I felt compelled to take a few pictures of gravestones with names that I knew I had seen within the Decker family tree. I had been here before (January 2002) and took some pictures, snow & all. 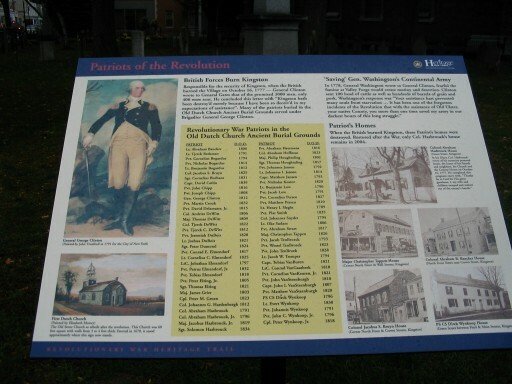 The final picture is a new plaque created by Donna Light, director of the Old Dutch Church Heritage Museum. 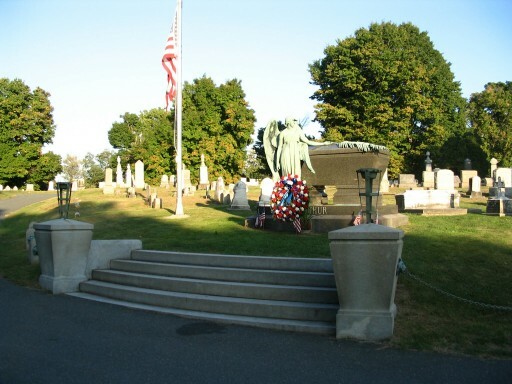 It lists those that served in the Revolutionary War that are buried on this site. 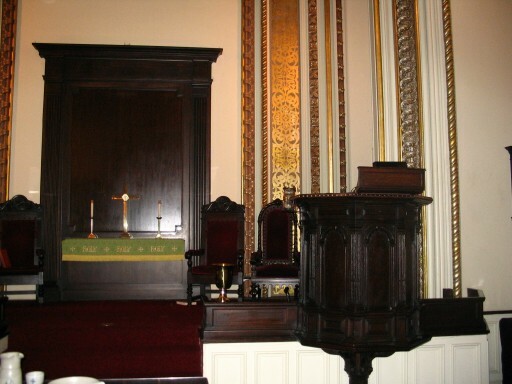 Donna gave us a great background of the church and lots of information within the church museum. I had been by this house before, but never inside. 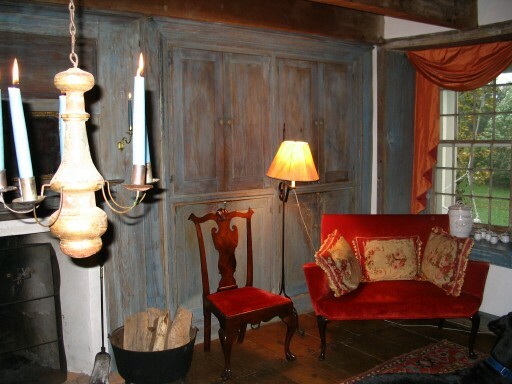 The house has been beautifully restored. 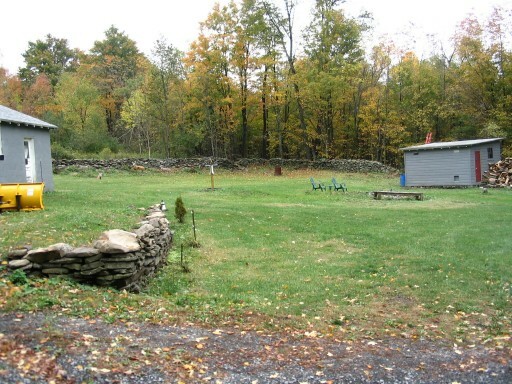 Located on the site of a 1694 land patent of 1280 acres near the Shawangunk church, the original home (a log cabin) on this site was built by Cornelius Janssen Decker (1670/76 - 1702). 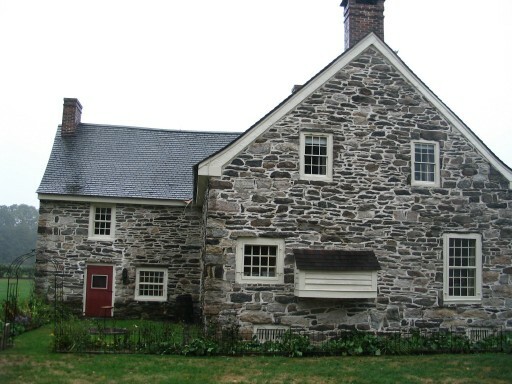 His son Johannes Cornelius Decker (1696-1742) later built the current stone house, which served the Decker family for several generations. 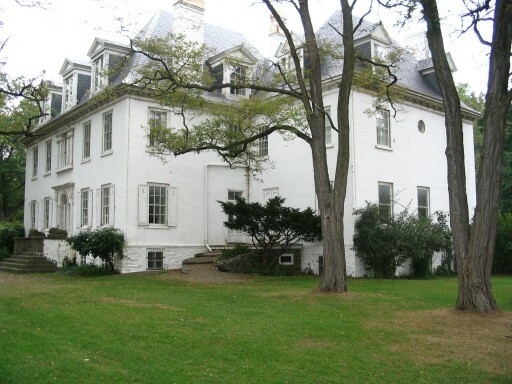 This is the home that was listed in the book "Dutch Houses in the Hudson Valley Before 1776," by Helen Wilkinson Reynolds, 1929, The Holland Society, New York; pages 189-190, listed in the Stories section of this site. 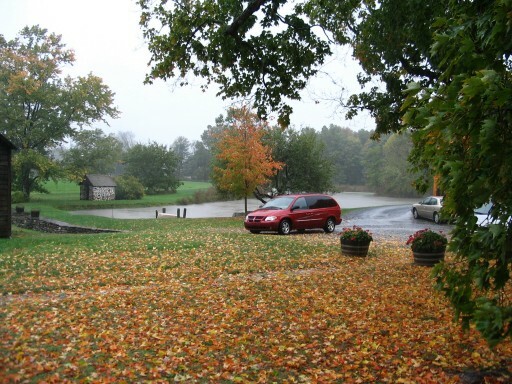 Although it was raining steadily on the day of our visit, the tour of the house was very special Extra pictures outside were taken quickly, but add to the scenery of the homestead. 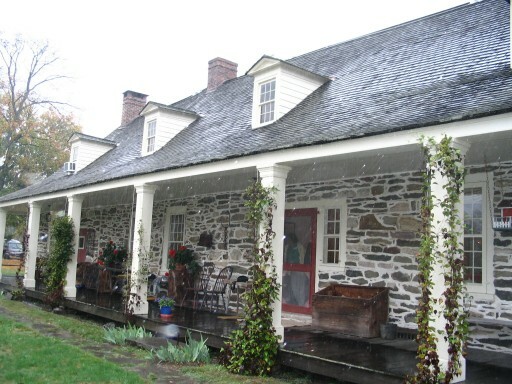 This home and its outbuildings were previously studied, and the blueprints are available on the Library of Congress American Memory site, and have also been posted on this site. 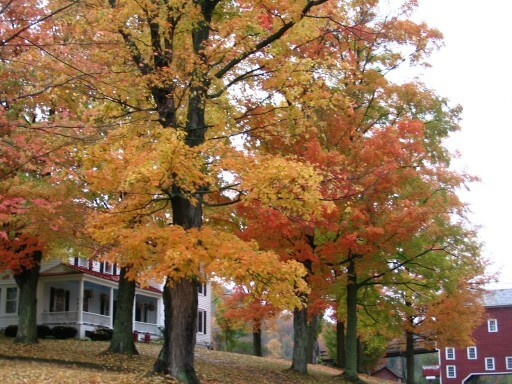 The top picture showing the site & surrounding trees (along with the fall leaves) is also available on this site in high resolution for use as a wallpaper. 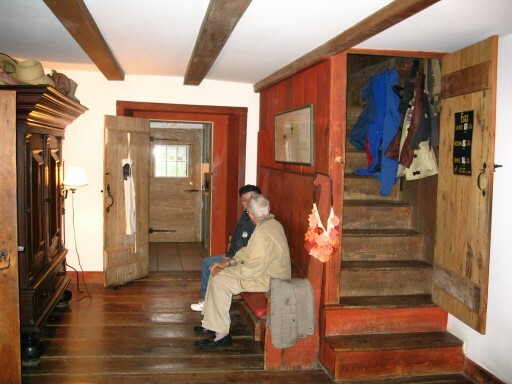 The inside of the home has been wonderfully restored by Ms. Bienstock, who served as a wonderful & gracious host during our visit. 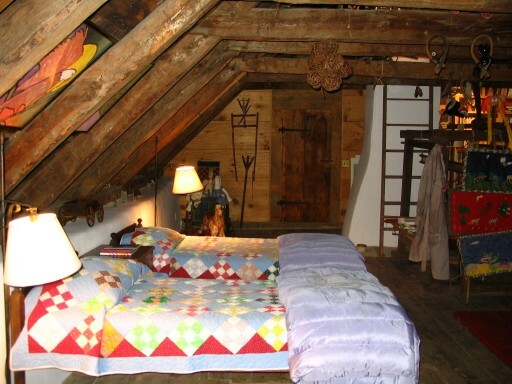 The top picture shows the room with large wardrobes, just inside the front door. The next three pictures show the room to the right of the entryway, which served us as an informal dining area with delicious snacks. 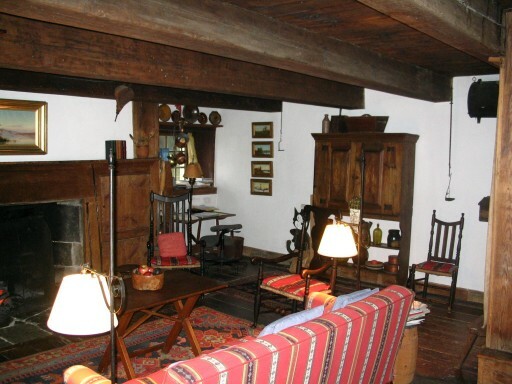 The fireplace added to the warmth of the room, and the shelves in the corner, complete with little statues of farm animals, completed the informal atmosphere of this room. 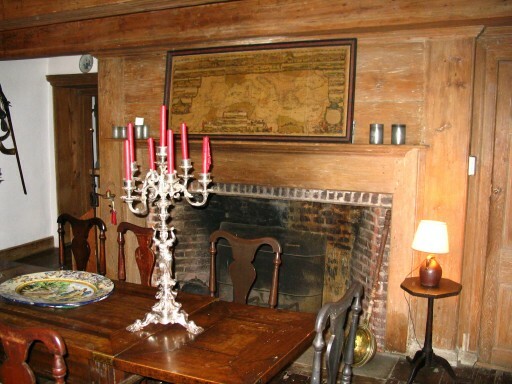 Next are two pictures of the more formal dining area, just to the left of the main entryway, followed by two pictures of the next room to the left (the far left end of the house), which serves as a living area, or study. 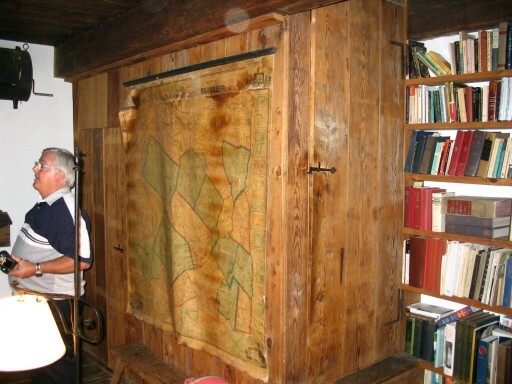 Of particular note is the very old plat map of Ulster County hanging near the corner. 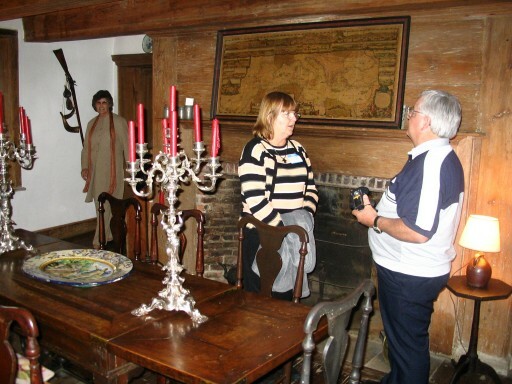 The final picture in this set is the room down the small set of stairs to the back of the house, which originally served as a room for the slaves. 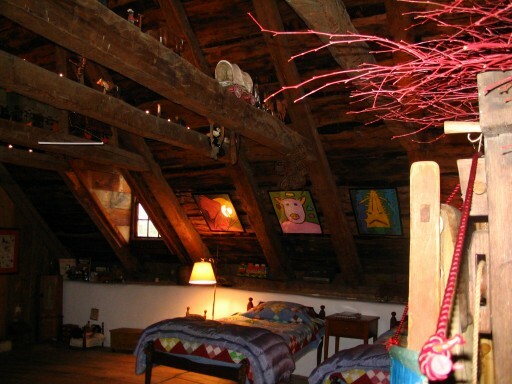 The upstairs portion of the home is complete with two beds, and lots of old toys. 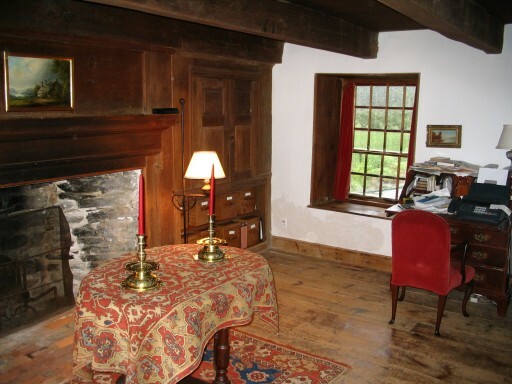 The age of the home can be felt by how uneven the floor is, but the room is decorated nicely and is still used today. 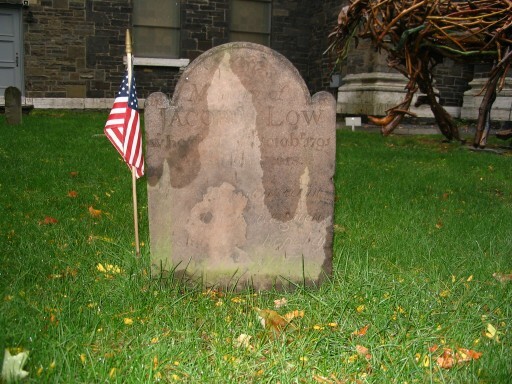 We spent the day Saturday, before & after our visit to the Decker house, at the Shawangunk Church. 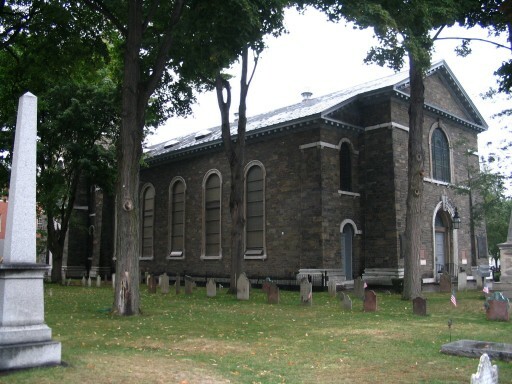 Behind the church is the old cemetery, along with newer sections. 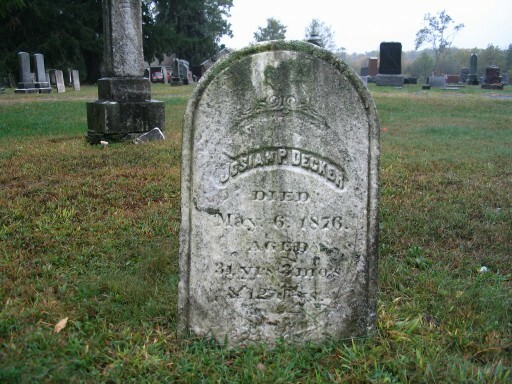 Being that Deckers were early settlers of this area, there are a large number of Decker graves within the cemetery located here. During our visit to the church we enjoyed many great presentations by those attending the reunion, including information on the DNA study, the location of the Netherlands where Jan Broerson was from (Husum), a story about Jesse "the Wanderer" Decker, and a wonderful artifact of what might be called "the Decker spoon:"
This spoon was shown by Jim Decker at the reunion, who purchased it out of a lot (auction materials also available) that contained items owned by a Decker. The spoon dates back as far as the 1500s, but contains some interesting inscriptions on the bottom of the bowl. 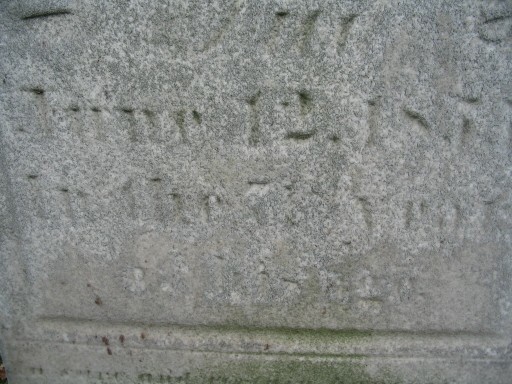 The first four letters (hard to determine them all) are not necessarily related, but underneath these are the letters JJD. On the handle the letters BKD are scratched. 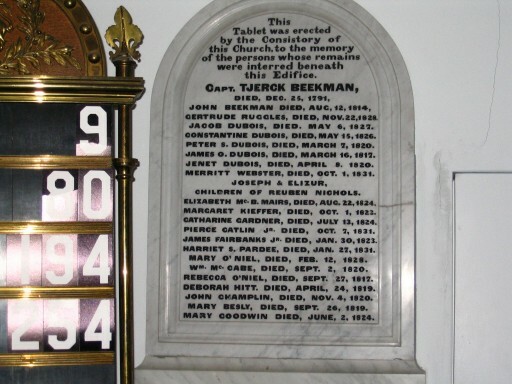 Are these the initials of Jan Jacobsen Decker and his wife Belytie Kortregt Decker? 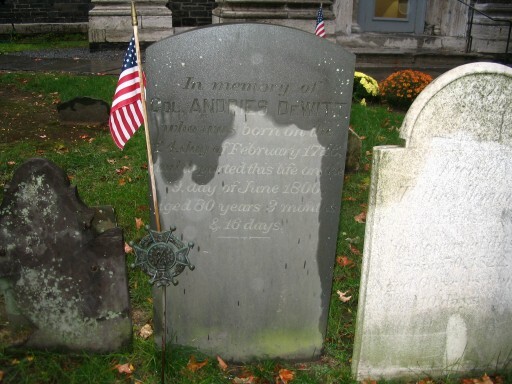 Only two days before, at the First Church of Albany, we had heard about the practice of the time of giving spoons to those who attended funerals, hence only those who were invited could attend. 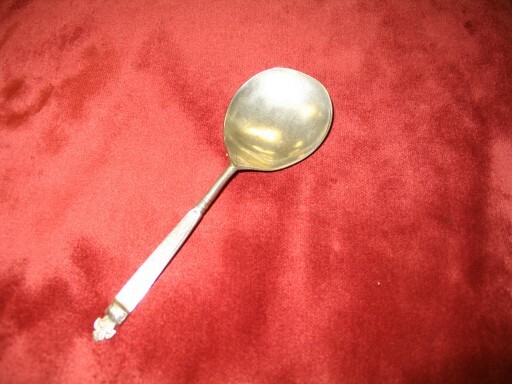 Could this have something to do with this spoon? Amazing how much interest one can have in a spoon. Sunday morning we left Kingston and began our long, meandering journey home. And I do mean MEANDERING. 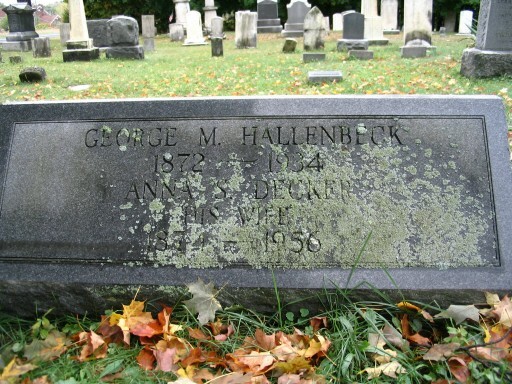 Part of the enjoyment I have on trips like this, besides taking the occasional out-of-the way route, is to visit some of the towns, churches, and cemeteries that I keep entering in my family database. 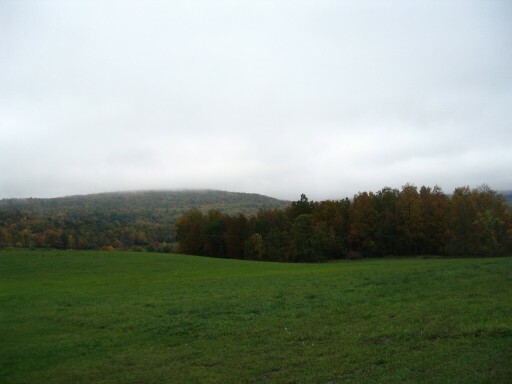 Therefore today I wanted to see such places as Linlithgo, Claverack, Westerlo, and South Berne - all for reasons I will describe as I mention each location. 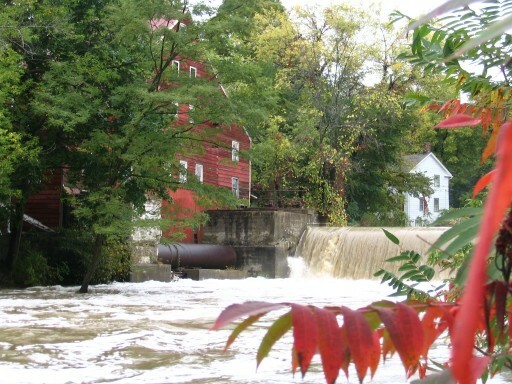 First stop, then, ended up being in Claverack. 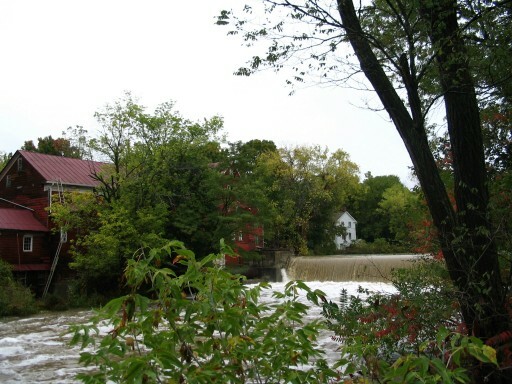 I keep seeing baptisms in the family records in Claverack, so I wanted to see where it is in relation to other towns, and what it looks like. 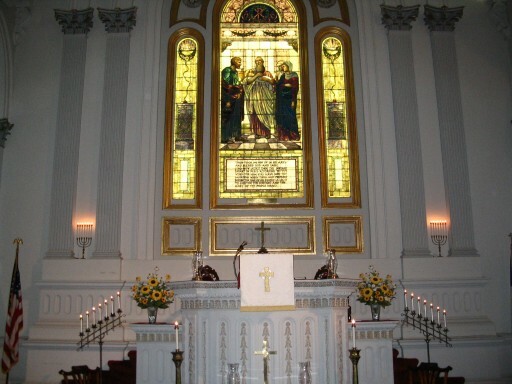 If I found a church, that would be a bonus. But driving into town with no real plan ahead of time, you take what you can get. What we got was this mill. 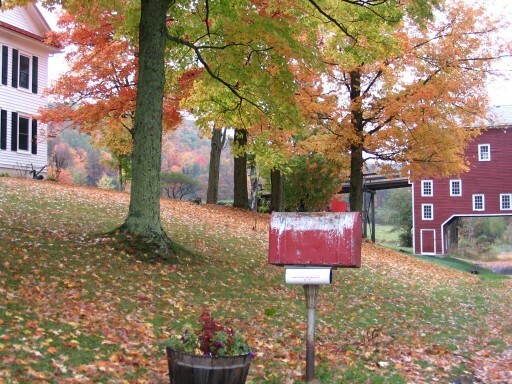 The fall colors were just about right to get some great pictures. 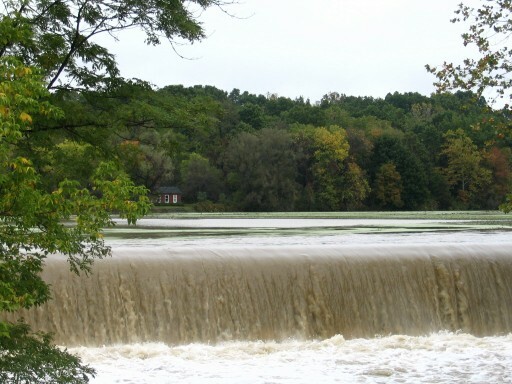 This was at the end of nearly two days of solid rain, causing much flooding in other areas of New England, so that may have had something to do with the amount of water flowing over the dam. Having only been there this one time, I may never know. 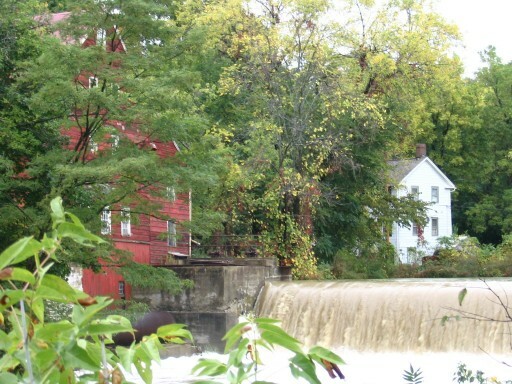 I climbed down the embankment next to the bridge to take the bottom picture, which is my favorite amongst these mill pictures. It's available in hi-res on my wallpaper page. Next up was looking for the site of the original Linlithgo Reformed Church, the site of many baptisms of Deckers, including the children of Gerrit Decker, great grandson of Jan Broerson. Now, this is where confusion sets in. 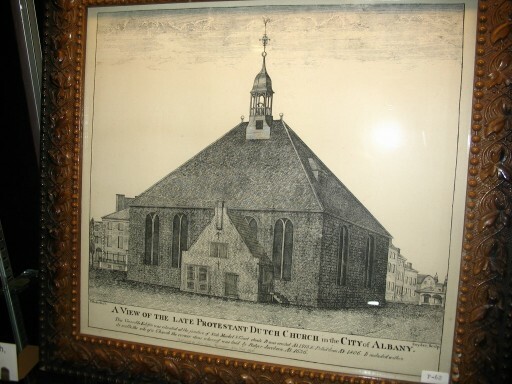 I understand that the original Linlithgo church eventually ended up being moved to the town of Livingston. Eventually another church was built on the site of what was the Linlithgo church, that being the Livingston church. 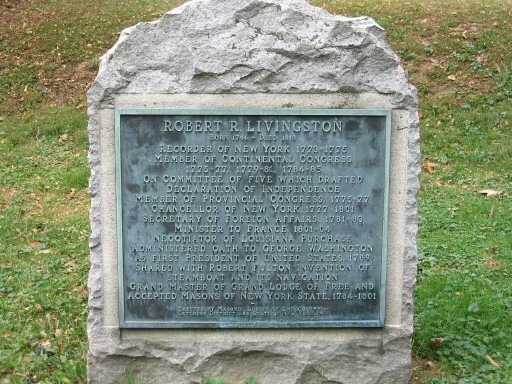 So the story goes that that Linlithgo church is in Livingston, and the Livingston church is in Linlithgo. Following my county based map of New York, I arrived at the site of what I figured would be the site of the original Linlithgo church, but it is now called the Mt. 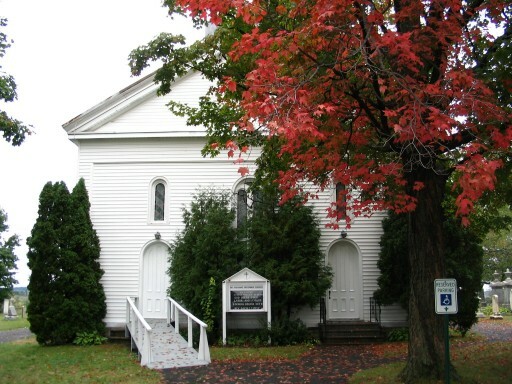 Pleasant Reformed Church. So where was I? 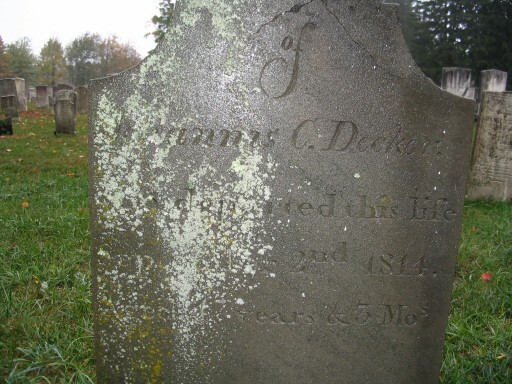 No matter where this is, there were a number of gravestones with Decker on them. 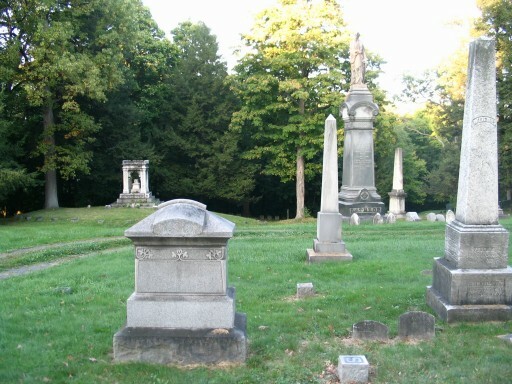 Wandering through the cemetery, I took a picture of all of them (I think). 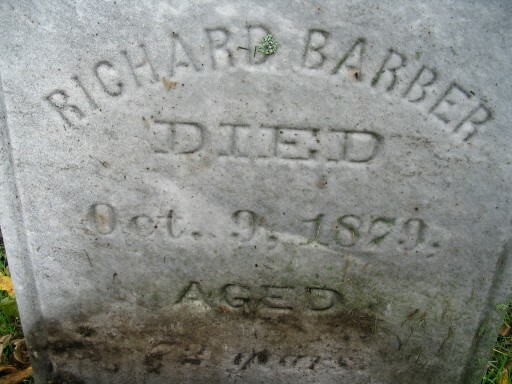 Someday maybe I'll get time to look into this a little more and figure out just exactly which cemetery this is. 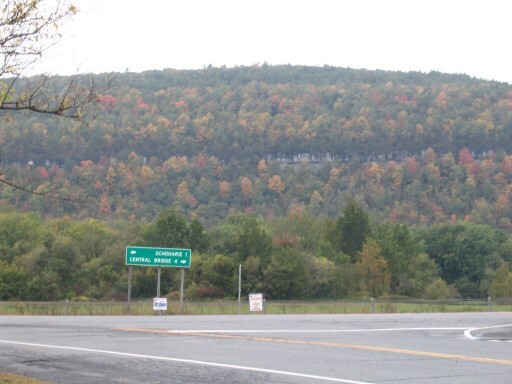 After leaving Columbia County, we headed back across the river and up toward Albany County. 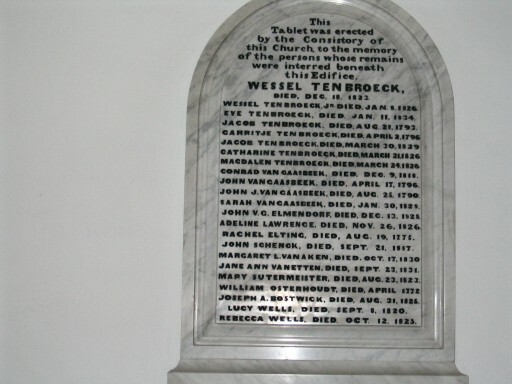 First destination was Westerlo, as I know that some family members had lived in this area. Its close proximity to South Berne, I've seen family members who appear in both places (including one who was counted in both locations in the same census). 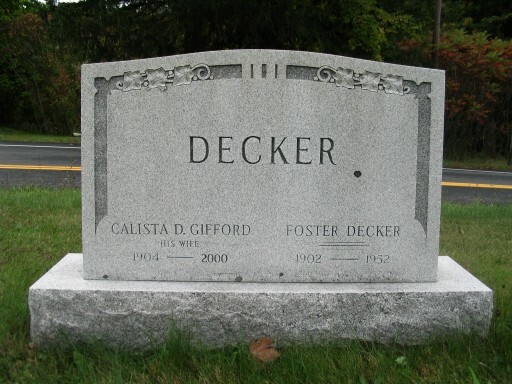 After a little driving around and getting directions outside of a church, we were able to find the cemetery just outside of town, but only one grave with the name Decker. 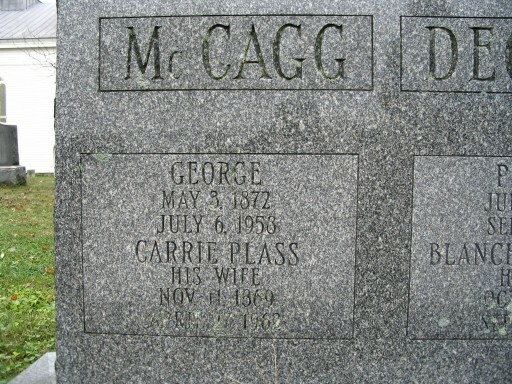 Turns out, this is the grave of my grandfather's second cousin (update: November 21, 2005). 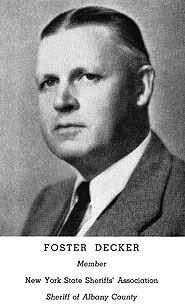 I was able to find a picture of Foster Decker on the New York State Sheriff's Association website from a 1940 convention. 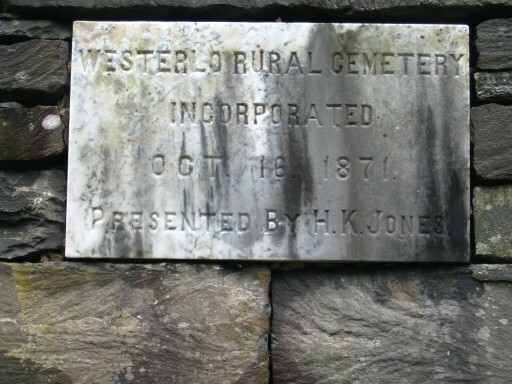 Foster is listed as Sheriff in the 1930 US Census for Westerlo, Albany Co., New York. No particular relevance, but just outside of South Berne we happened on this wonderful view. Smack dab in the middle of this field with the mountain behind it, and the changing trees, was this fairly new, large house. 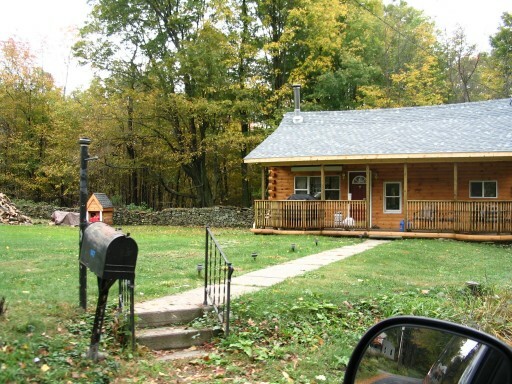 I took pictures of each side of the house, but managed to not get a picture of the house. The pictures don't really do justice to the color. 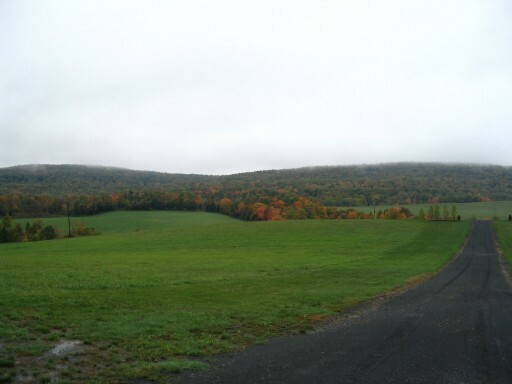 OK, so now we arrived in South Berne, Albany County, New York. 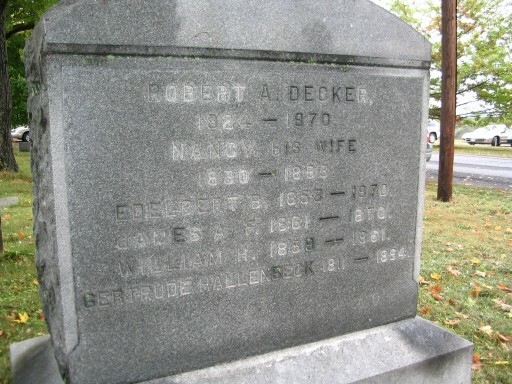 This location has particular relevance to me, because Michael Decker lived in South Berne (listed here in each census from 1830 to 1860), and his widow Elizabeth (Bovee) Decker is listed here in the 1865 New York state census, and she appears on the plat map for South Berne, as shown at the Berne History website. 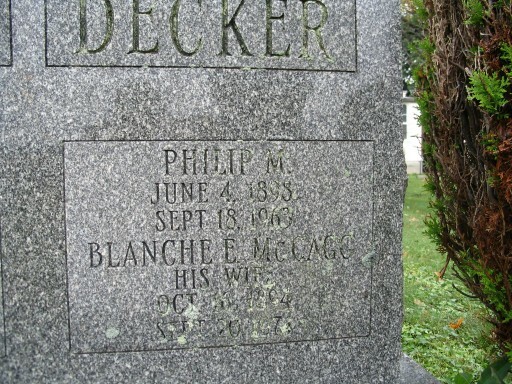 Samuel Decker, my great, great, grandfather was born here. 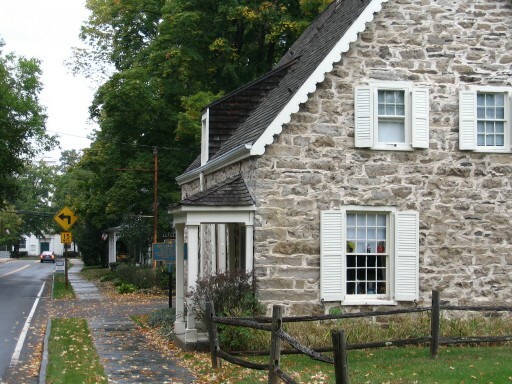 According to the 1866 map, Mrs. Decker lived on Watertrough road, right near where it curves slightly to the left. 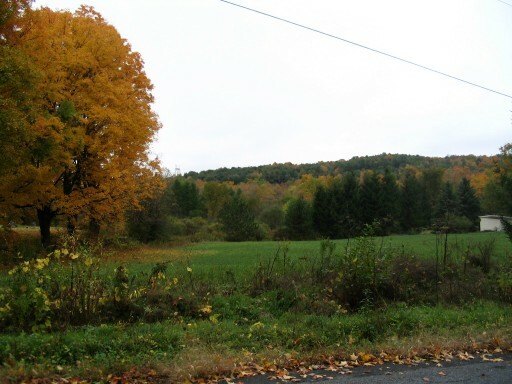 There are two homesteads shown in this area, that of J. Carl and Mrs. Decker. 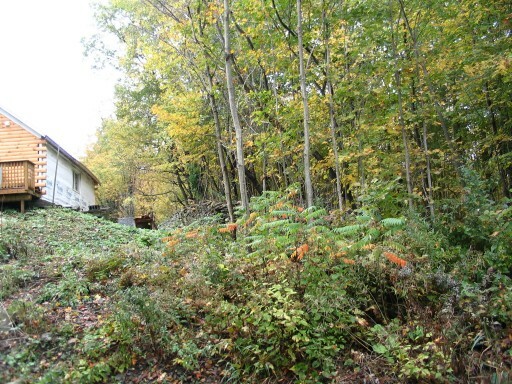 The pictures show the current homes in this area, with the first home being farther up the road and surrounded by an old stone wall (this home is shown in three pictures). 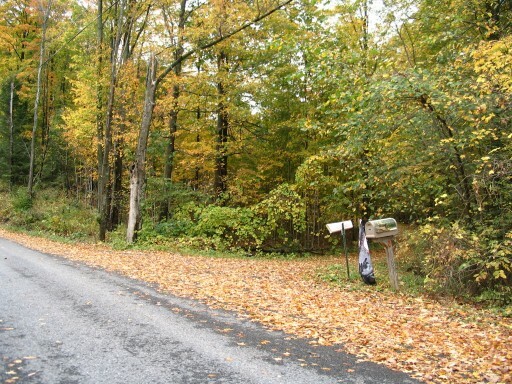 The next picture (the mailbox by the road) is just before and down the hill from the new log-style home, and is probably the site of the 1866 Decker home. 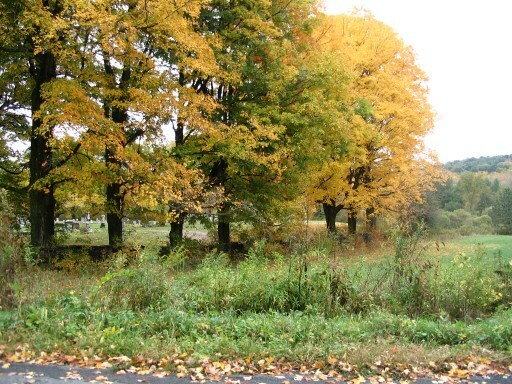 Just before these both of these homes is the entrance to the cemetery, South Berne Rural Cemetery. 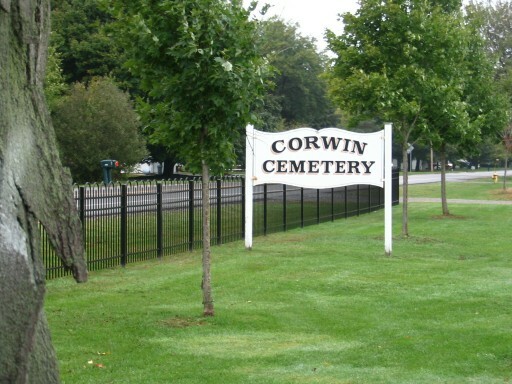 Just before the cemetery is an empty field. The last picture shows the intersection of Watertrough & Church roads, with the picture taken from Watertrough Rd. An interesting thing happened while on our way to getting lost. Figuring that we were pretty much done with genealogy, family history, cemeteries, and such for the day, we were heading north toward (eventually) the toll road. 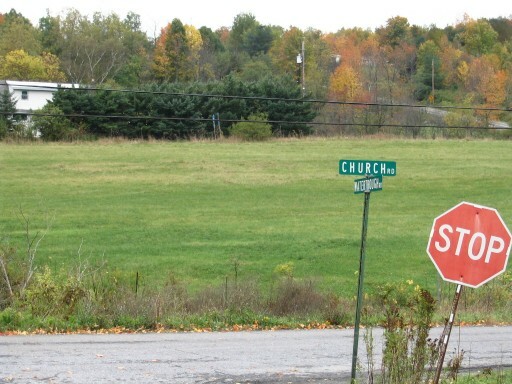 A little baffled when I reached Schoharie, New York, I wasn't sure which way I really wanted to to (I wasn't expecting to have to turn). 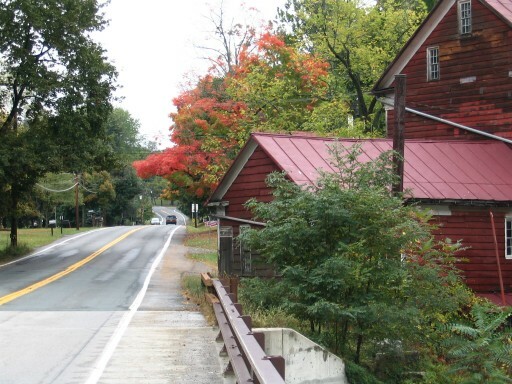 Anyway, at this intersection (which I took a picture of due to the color of the trees on the side of the mountain), we spotted a covered bridge off to our left. This seemed to be a nice place to stop & stretch, and figure out our best move. 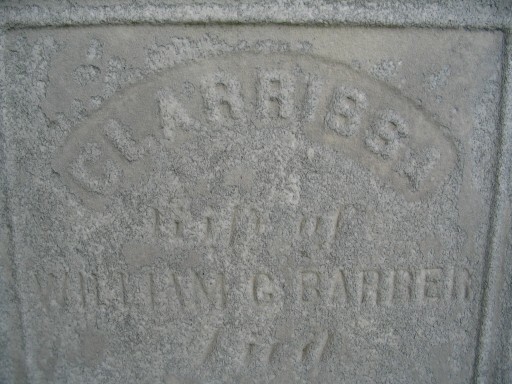 Walking across the bridge I spotted a cemetery ahead, in the town of Schoharie, NY. 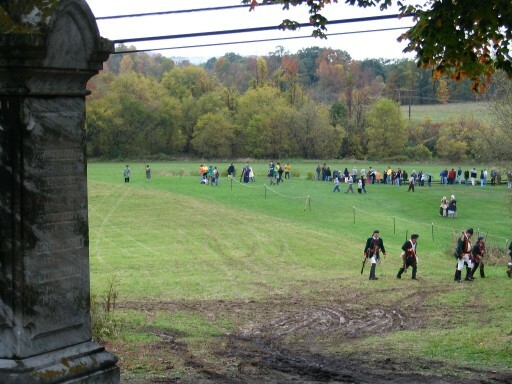 Walking on ahead, we also discovered that it happened to be the day (Old Stone Fort days) in which the town does a Revolutionary War re-enactment - right across from the cemetery. Browsing through the cemetery (quite large) in search of Decker graves (why not - we're here kinda thing) wasn't producing much. With all the people around I decided (with a little persuasion) to go inside the museum and ask. Being short staffed, I was initially rebuffed in my attempt, but given the small nature of my request, I was rewarded. 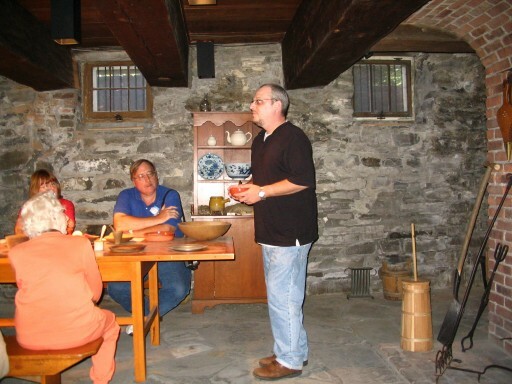 The staff at the museum in Schoharie, New York was very gracious in the midst of all that was going on, and I am very appreciative. 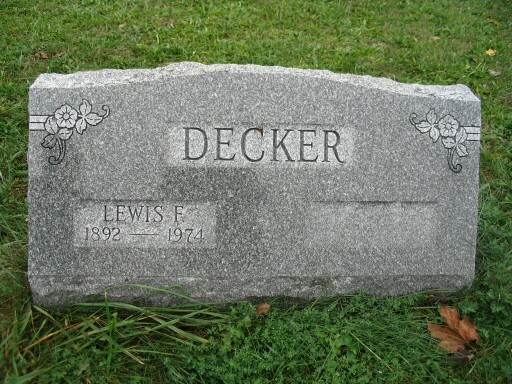 I soon found out that there weren't any Deckers buried in this cemetery, but there were in other cemeteries in the county. 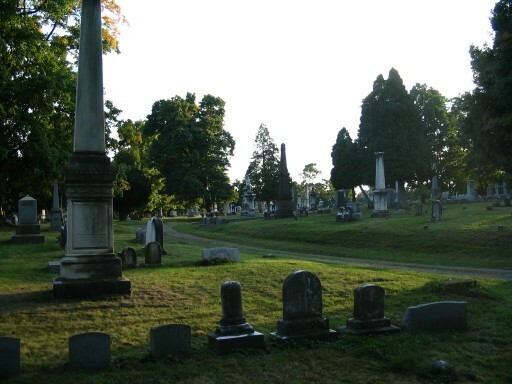 With time constraints & the casual nature of our drive, we didn't really have time to go searching for even more cemeteries. 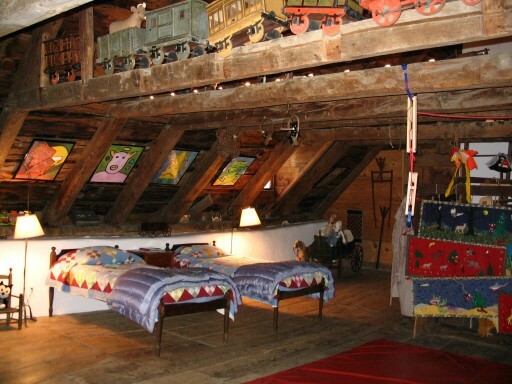 But then it was suggested that we might be interested in "The Decker Barn." Yes, this did sound interesting. See below. 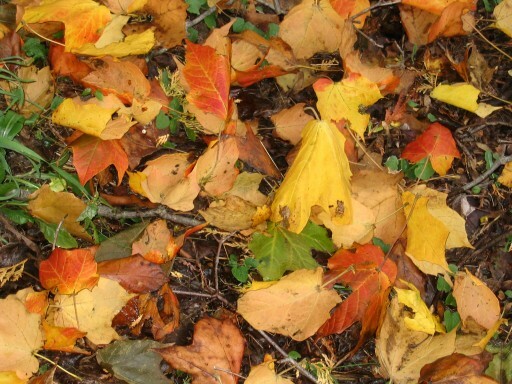 Finally, I just happened to look down at the leaves in the cemetery, and thought they provided some interesting color, so I took a picture. I liked it so well, I made it into a wallpaper, also. OK... So... 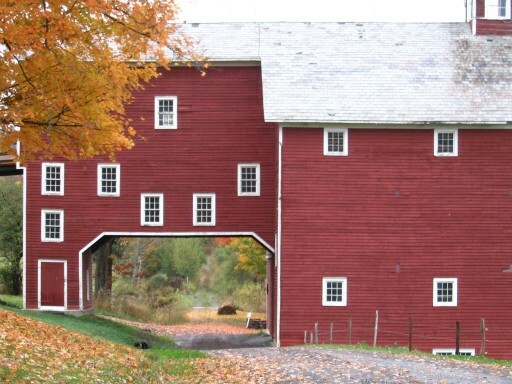 The Decker Barn? 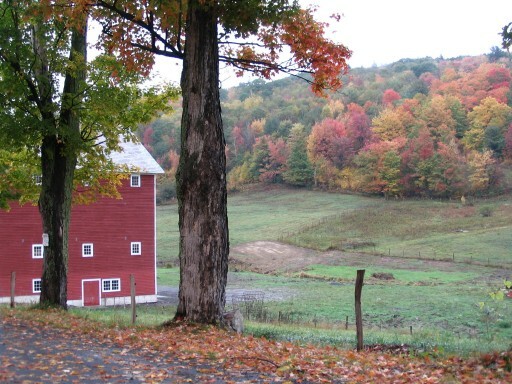 The unusual feature of the barn, we were promised back in Schoharie, was that the barn was built so that it straddled the road. One of the workers in the museum remembered walking by it on her way to school every day when she was younger, although she didn't think you could still drive through it. 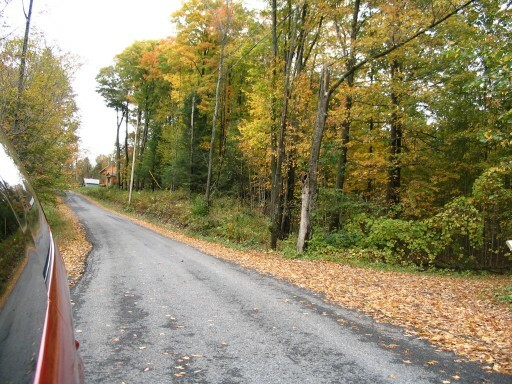 She gave us very good directions, and the meandering through the countryside continued. Instead of continuing to head northwest to reach the interstate, we headed to the southwest. This further insured that we'd spend even MORE TIME driving. But it was worth it. 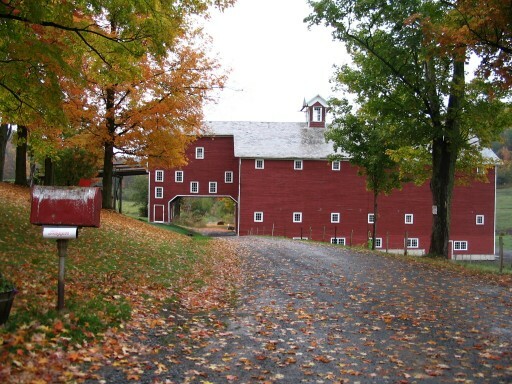 At the south end of the Town of Blenheim, in Schoharie County, New York, we found the barn as described. Near the intersection of Starheim (formerly Decker) Rd. & Curtis Rd. 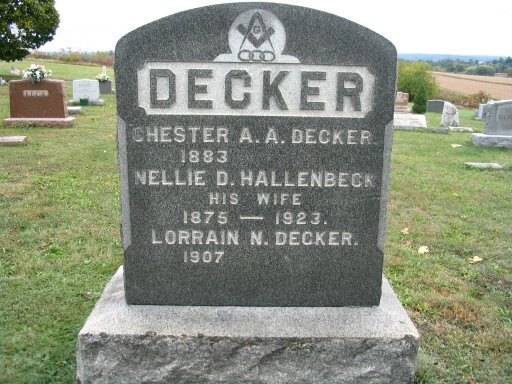 I was given some basic information on the Decker families that lived in the area, but need to do more research. 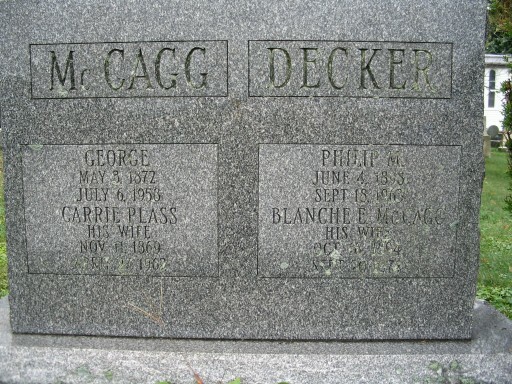 George Decker, son of Tunis Decker, is mentioned in the area history. 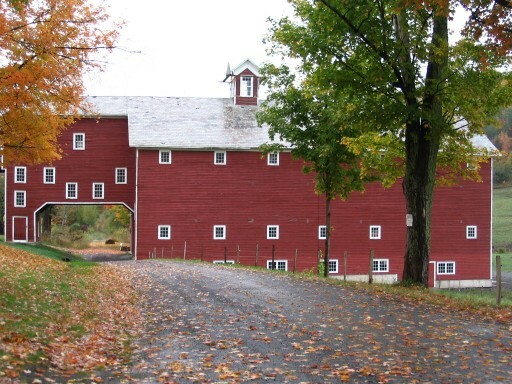 It discusses him living just south of the property on which the Decker barn sits. 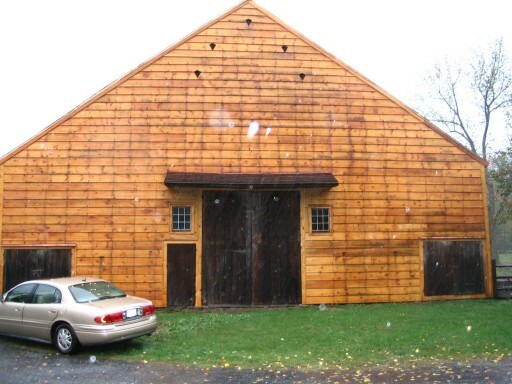 From what I gather, the barn was built approximately in the mid-1800s, but again I have to look into this more. 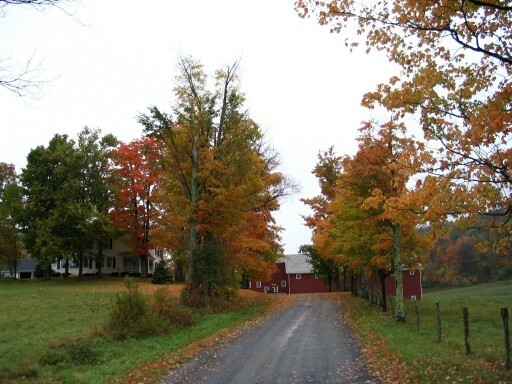 The pictures clearly show the road going through the barn, but beyond the barn it is nothing more than a two-track trail, which would be impassible. 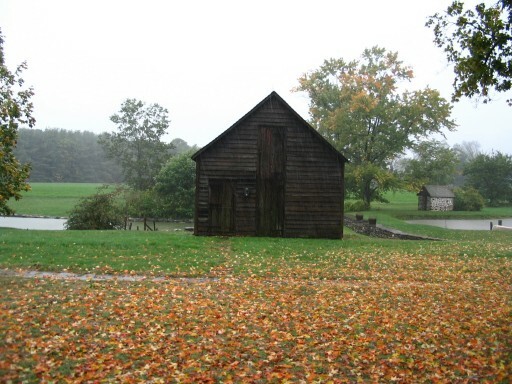 With the many "No Trespassing" signs posted, rain, and lack of time, we ended up pressing on after taking pictures of The Decker Barn. 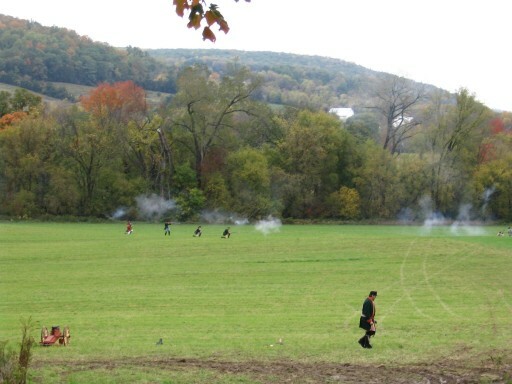 So... upon leaving here, we had lots of ground to make up. After pretty much a full day of driving, and much driving through the mountains north, we finally reached the toll road - less than an hour west of Albany (about two hours from where we started the day). 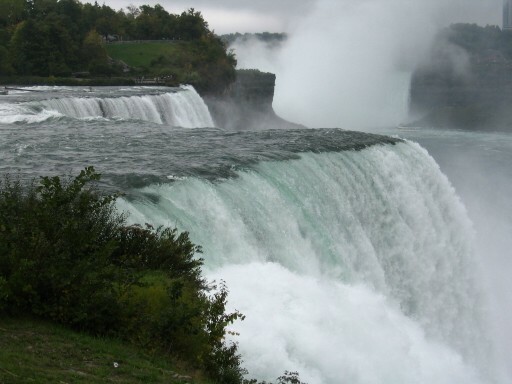 My goal of reaching Buffalo by the end of the day was pretty much shot. After following highway 20 for a while, we finally turned north on highway 12 (major construction, oops!) due to the necessity of finding someplace to eat. 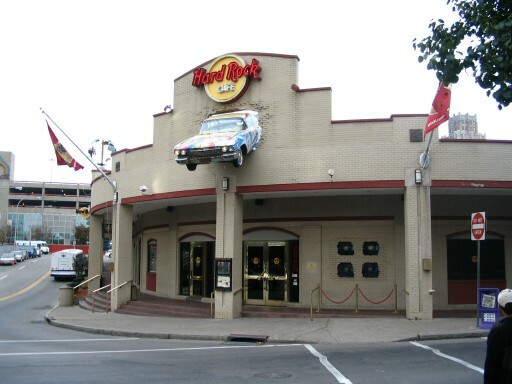 This was accomplished in Utica. We finally crashed for the night at the Comfort Inn just outside of Syracuse. 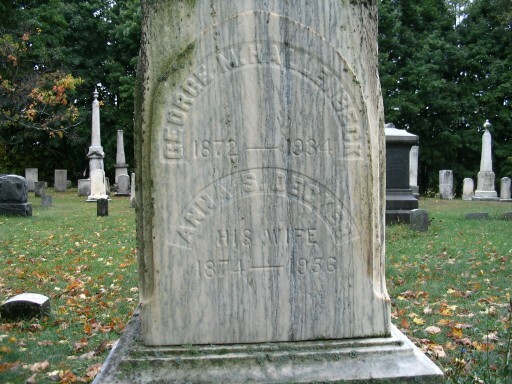 One final stop on the way home that had to do with family history was to visit Newfane, Niagara County, New York. 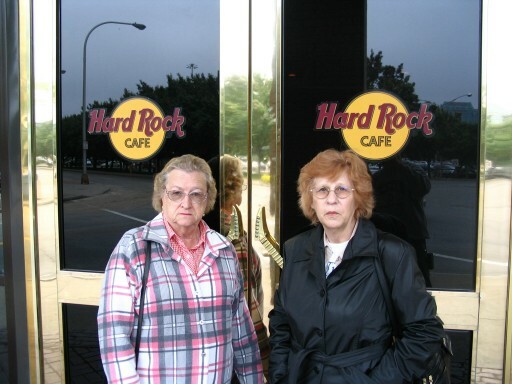 Although I had been here before, My mom and aunt hadn't. 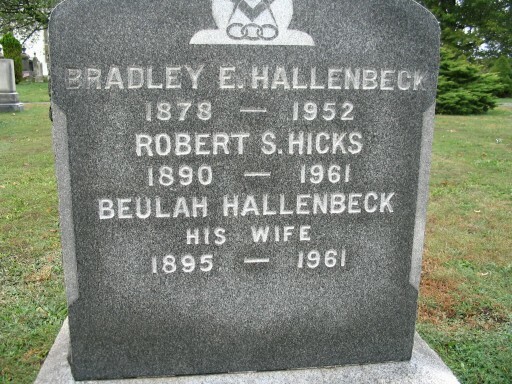 This really had as much to do with showing my aunt where her grandfather was born & lived than anything else. 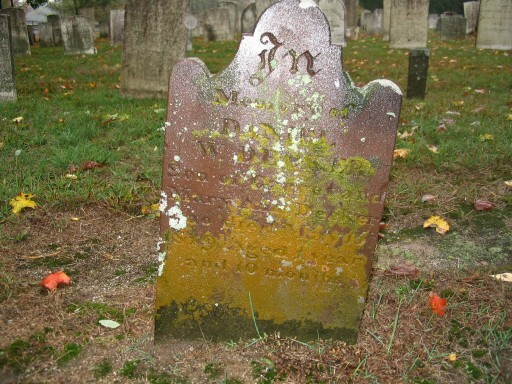 We stopped and visited the cemetery again. 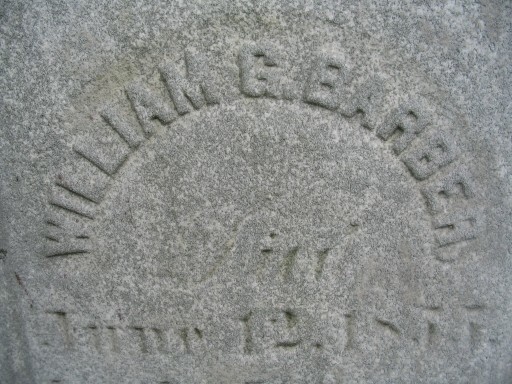 While Samuel Decker and his wife Mary Lovina Barber are believed to be buried here, again there are no records, and no headstones to prove this. 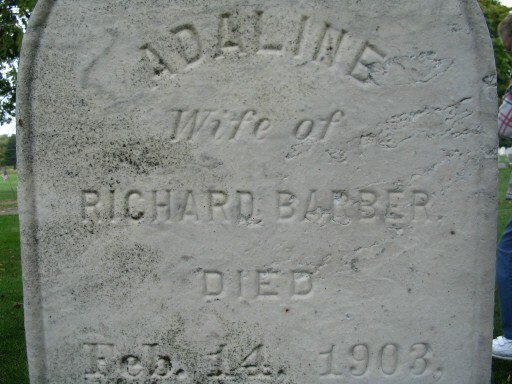 Her parents are buried here, and there are several missing & broken stones. 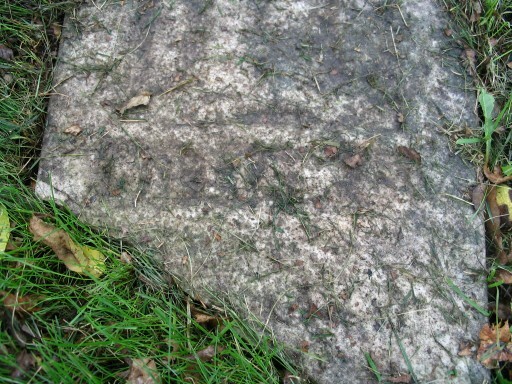 It was interesting to focus the digital camera on the stones that are there, it seemed to help to bring the worn writing into focus a little bit. Probably more pictures here than were necessary, but since my last visit here as in January 2002, this time I was able to take some pictures without interference from the snow. 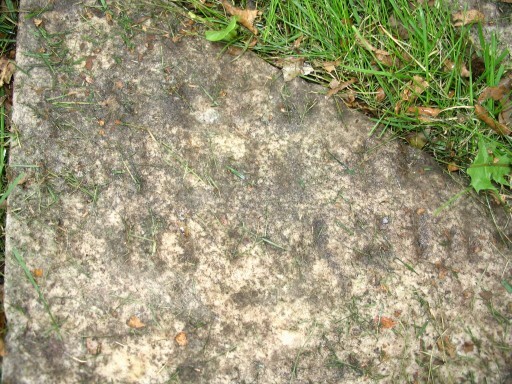 I took extra pictures here so that I could focus in on the stones very closely, taking top & bottom pictures as necessary. 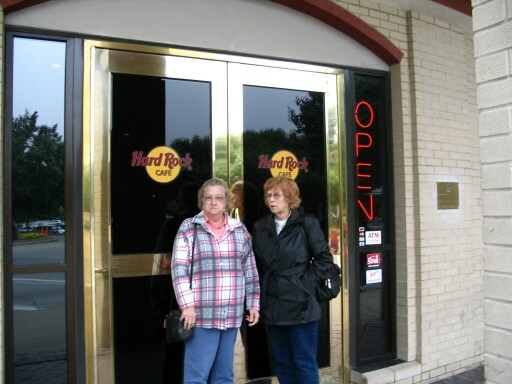 What can I say, but it's Hard Rock Cafe. 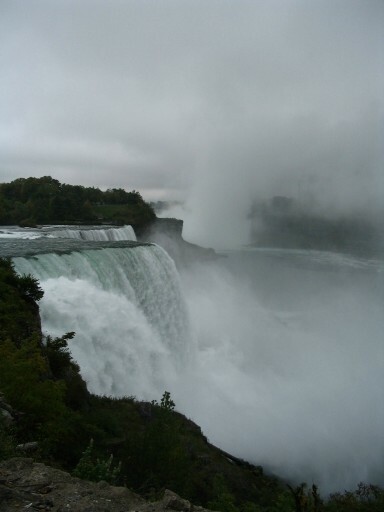 We stopped on our way through Niagara Falls. 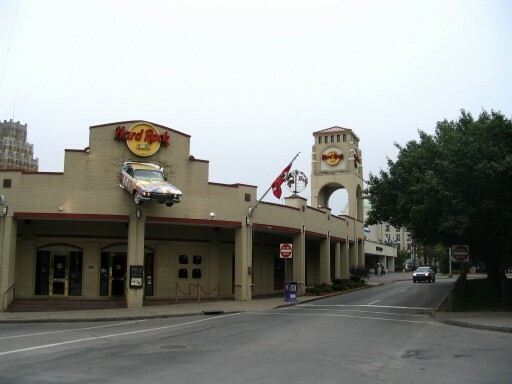 As much for the shot glass (for me) as for the food, but I do have an All Access Card, and try to stop at any & all Hard Rock Cafes that I come across in order to buy the shot glass. 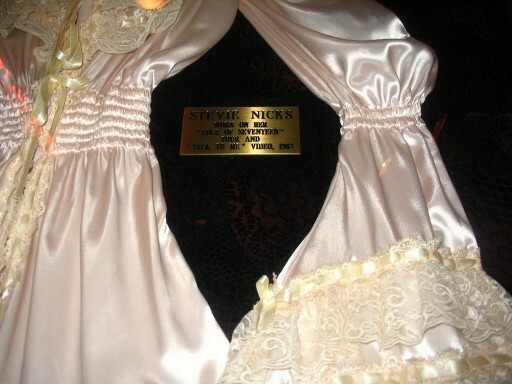 This one has items of particular fondness for me, as I consider Stevie Nicks to be my favorite singer. 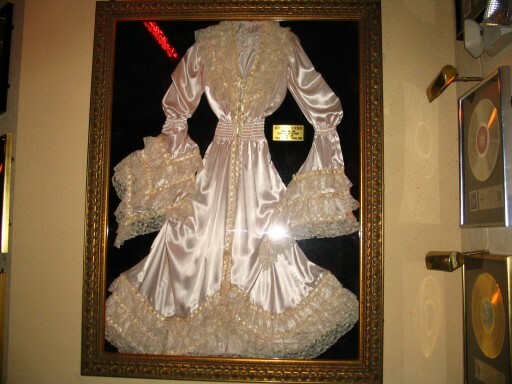 On display is the Fleetwood Mac platinum album for "Rumors", and the dress that Stevie wore during the filming of the "Edge of Seventeen" tour and "Talk to Me" video (1982). 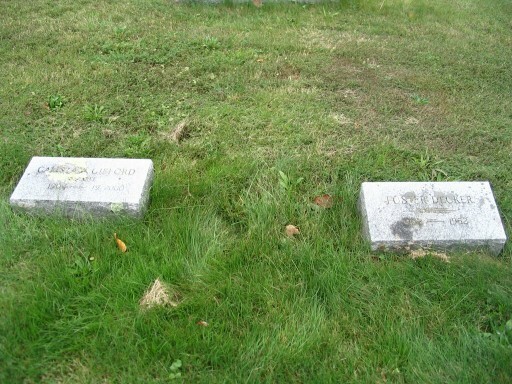 And for proof, I have pictures of my mom (Nora Decker) and my aunt (Jean [Decker] Hanke). And they both enjoyed their bowl of chili. For the record. 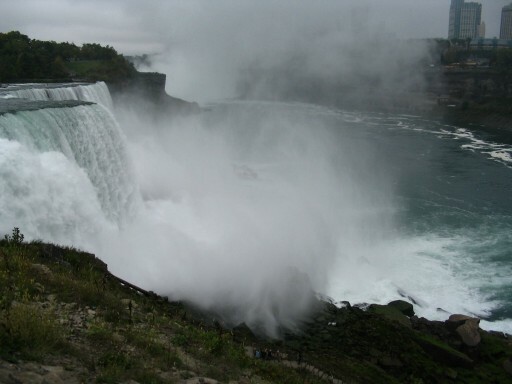 Finally, no trip to Niagara Falls is complete without... well... actually seeing the falls. 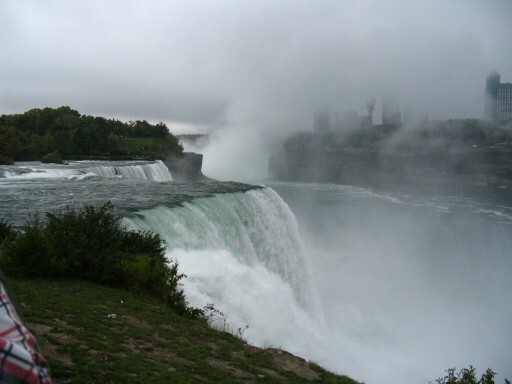 Although it was cloudy & somewhat misty during our stop, the visit down to the falls on the American side was still worthwhile, and very relaxing. 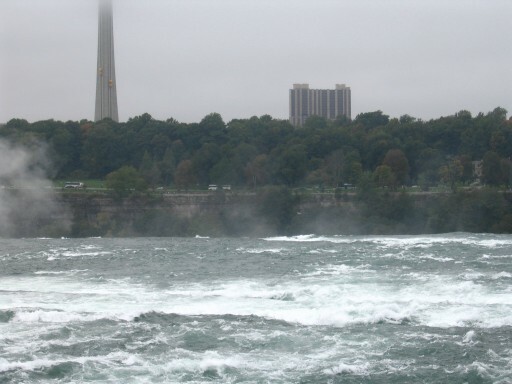 After I noticed the Hard Rock Cafe on the Canadian side of the falls, just across the river, I decided that from here too, I also needed a shot glass. This was much more of an adventure than the simple meal and souvenir that was had on the American side. 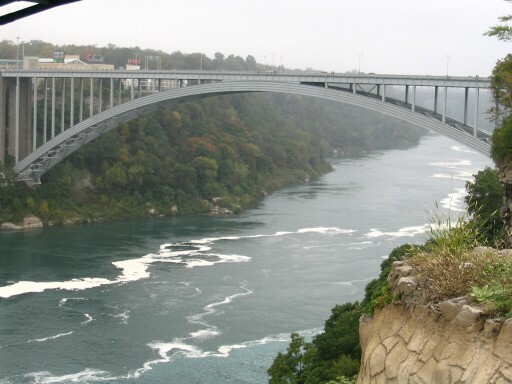 Perhaps because it was Columbus Day, and many schools in New York didn't have class that day, but there were MANY tourists in Niagara Falls, Ontario, that day. Way too many. Needless to say, once I had my (much more expensive) shot glass, we couldn't wait to head out of town and head for home. Overall, we drove about 1700 miles on this trip. We saw a lot of Decker history, some scenic drives through the mountains, a lot of trees changing color, and many other sites along the way. We ate a lot of food, met some great cousins (who've been at this longer than I have), and thoroughly enjoyed ourselves.